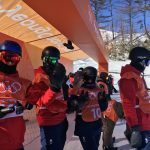 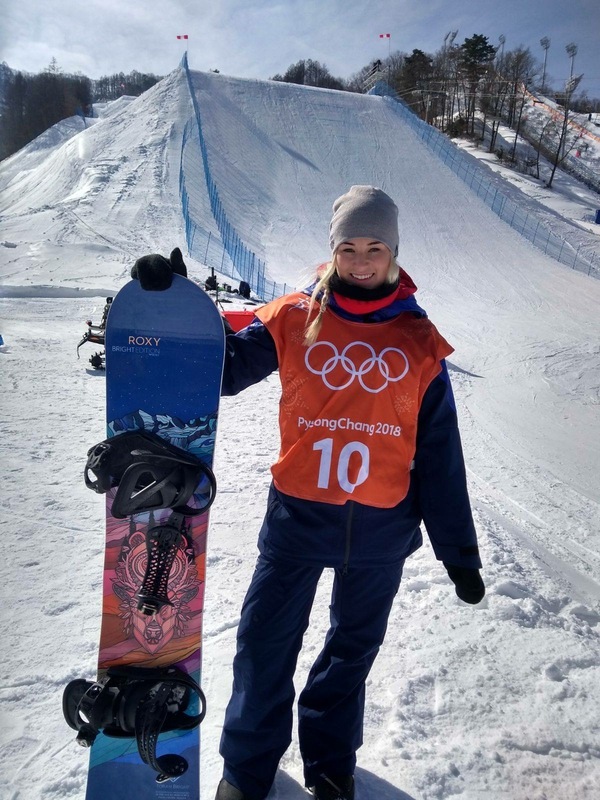 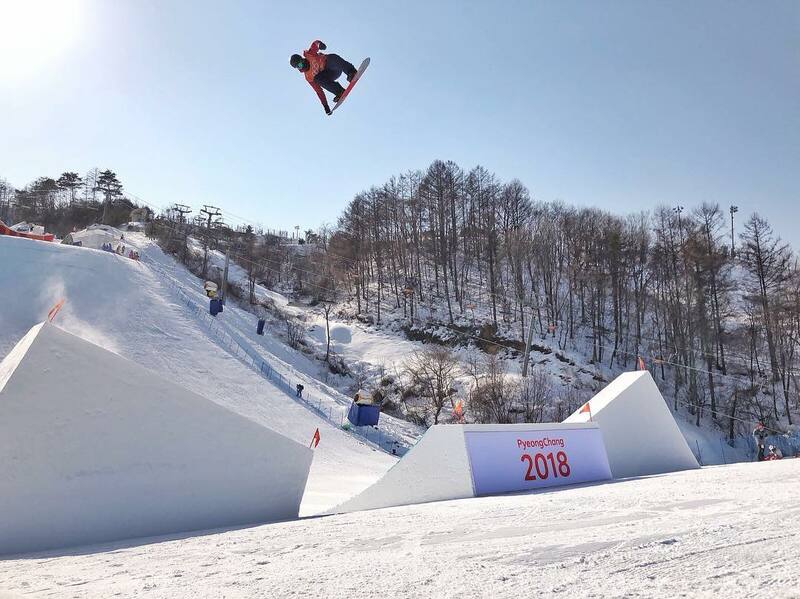 We are following our own Rowan Coultas and the GB Park and Pipe Team who are competing at the Winter Olympics 2018 in PyeongChang, South Korea. 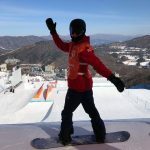 Every day we will post photos from the best blog posts that we have seen online. 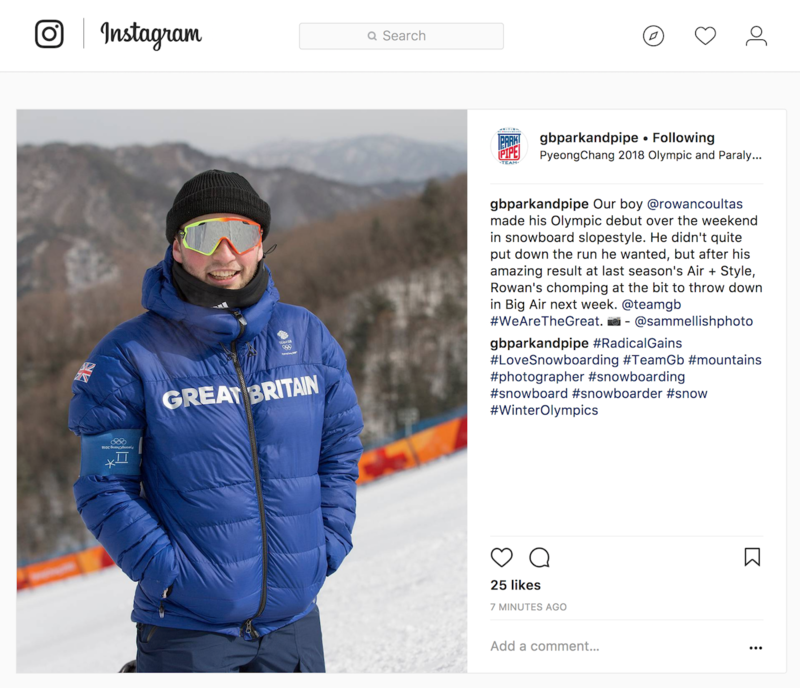 You can also follow Rowan and the teams progress online via social media. 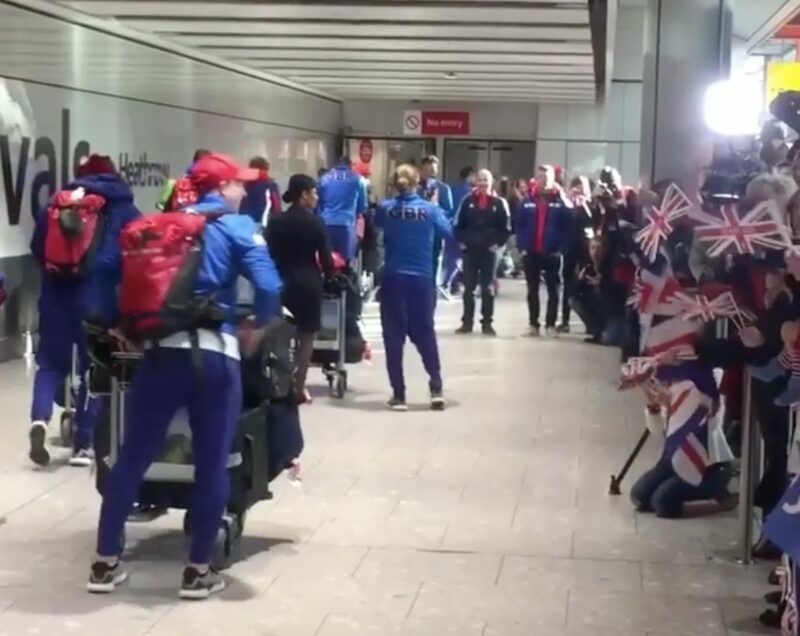 Home again for a well earned rest. 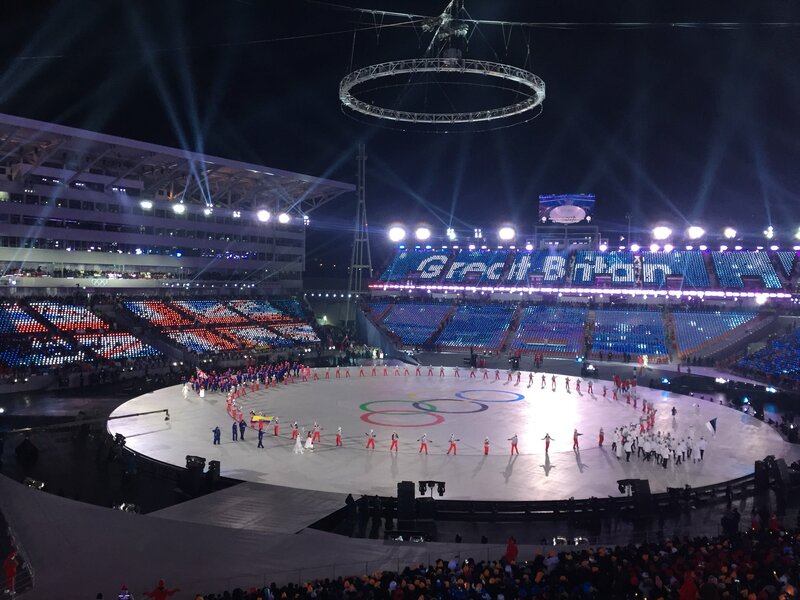 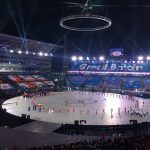 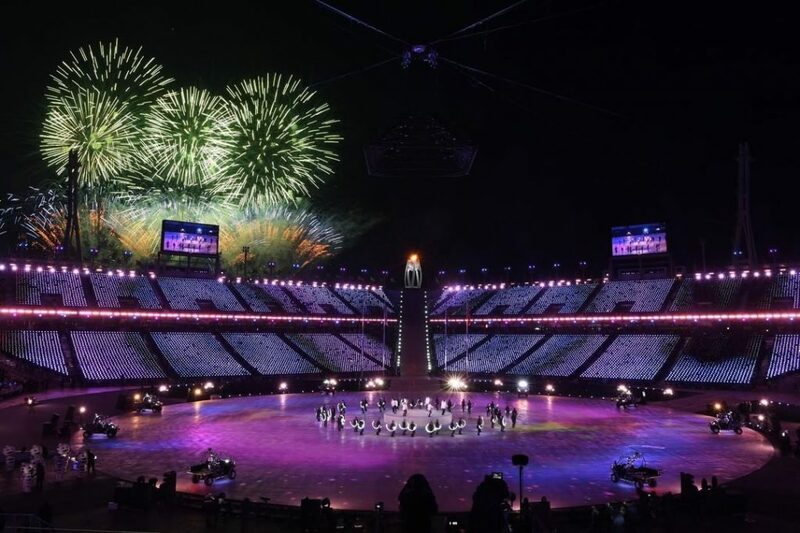 After 2 weeks of intense competition the PyeongChang Winter Olympics came to an end in a spectacular closing ceremony. 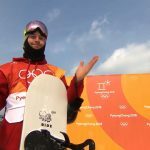 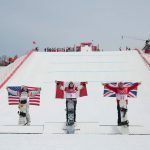 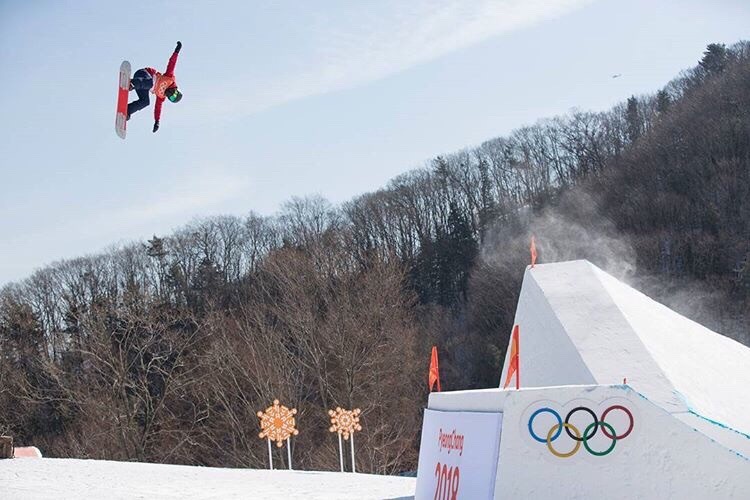 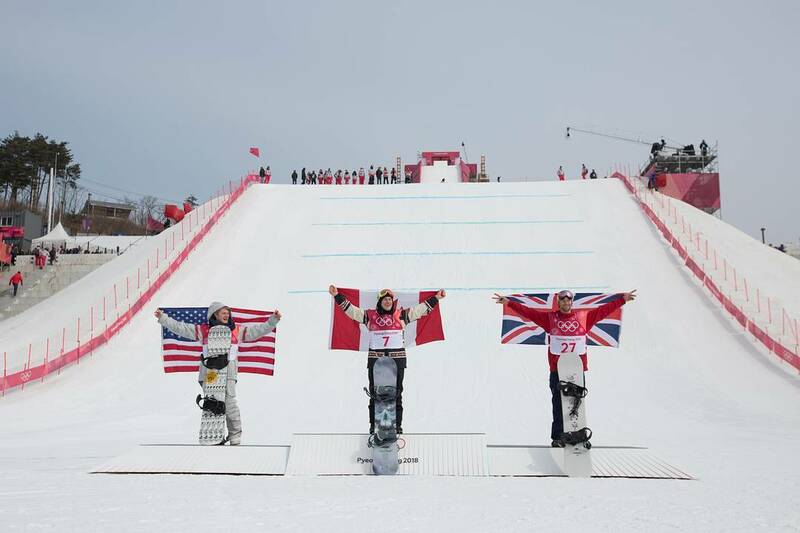 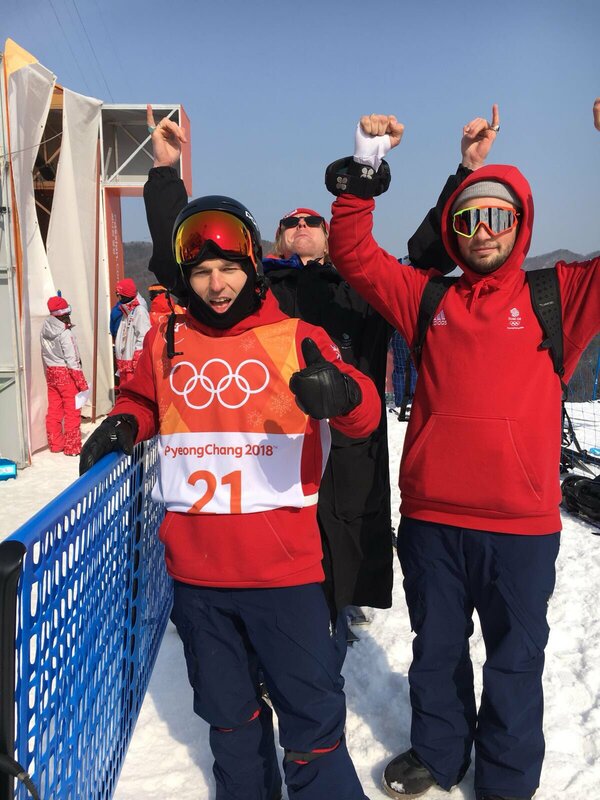 Billy Morgan kept us on the edge of our seats in the Mens Big Air final as he courageously threw of a fall in practice and his first run to produce 2 amazing jumps to finish in the Bronze Medal position to secure the teams best ever Olympic medal haul. 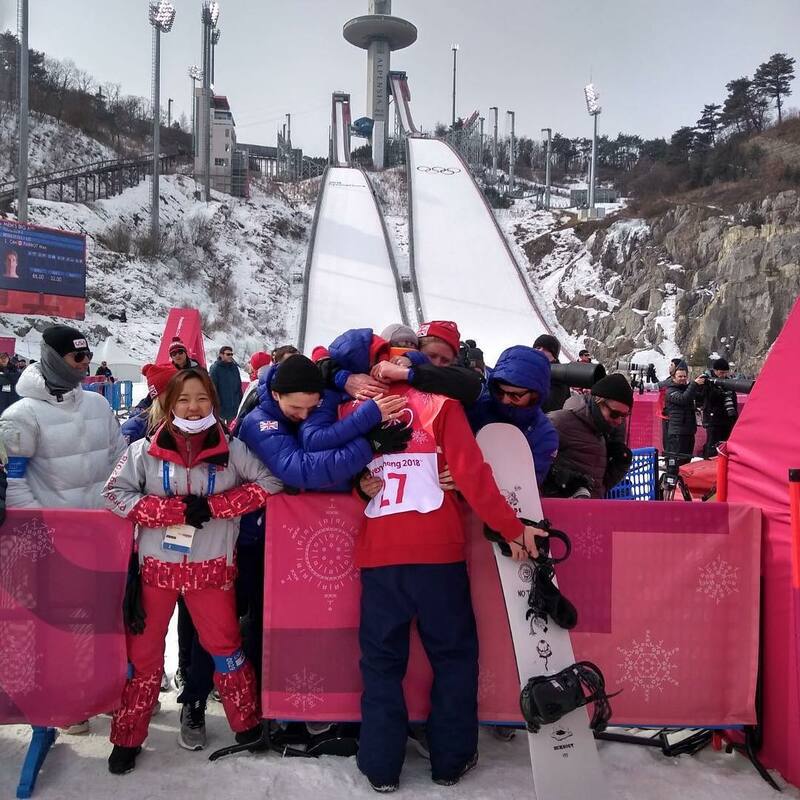 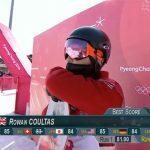 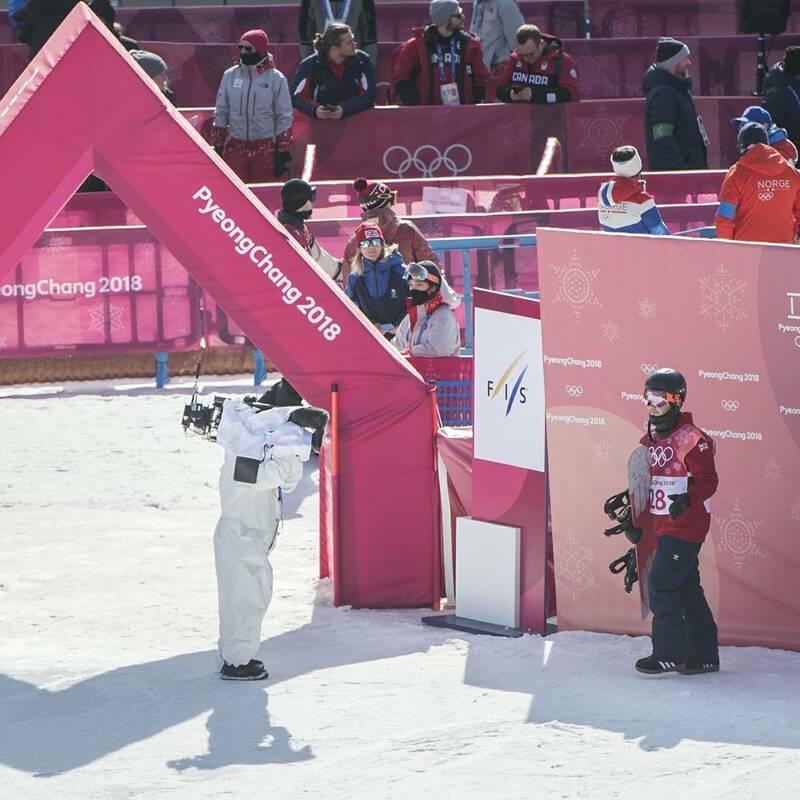 Rowan was with him at the top of the jump to support his team mate and one of the first to congratulate him after a tense wait to see if his final jump would keep him on the podium. 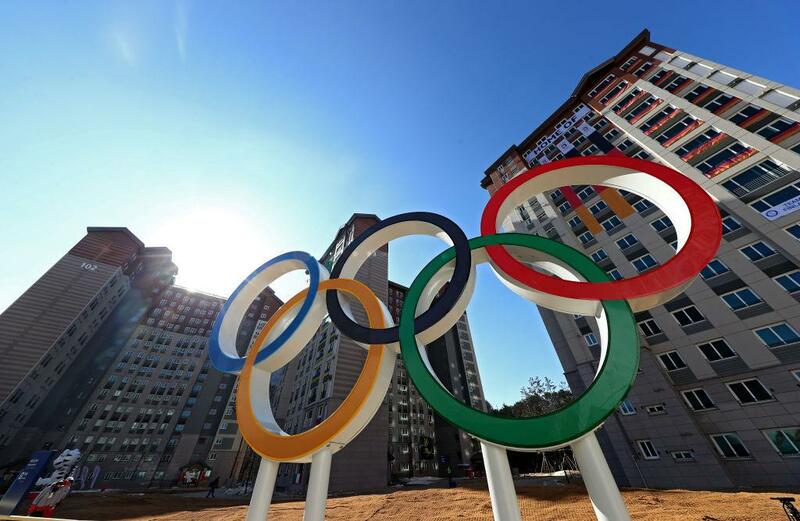 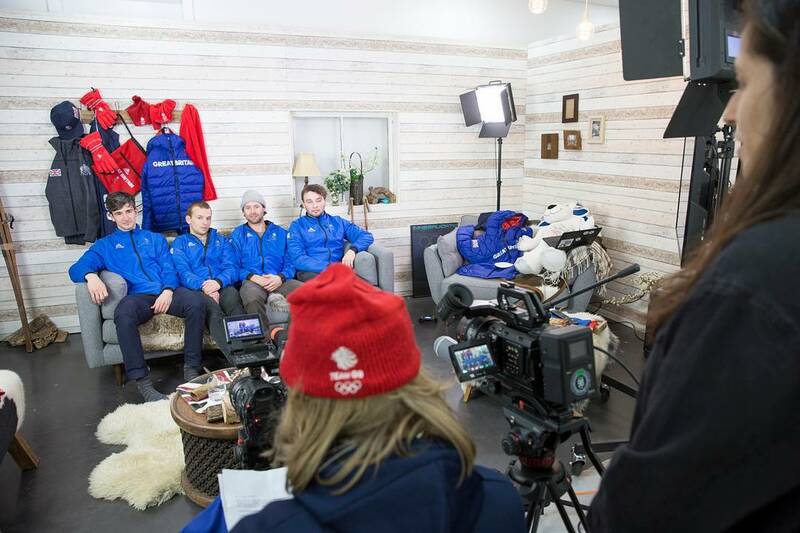 A busy few days supporting the rest of the team as they attempt to make this the most successful Winter Olympics ever. 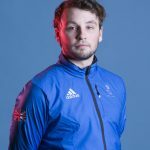 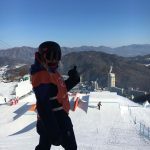 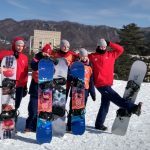 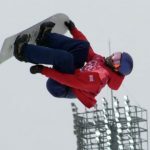 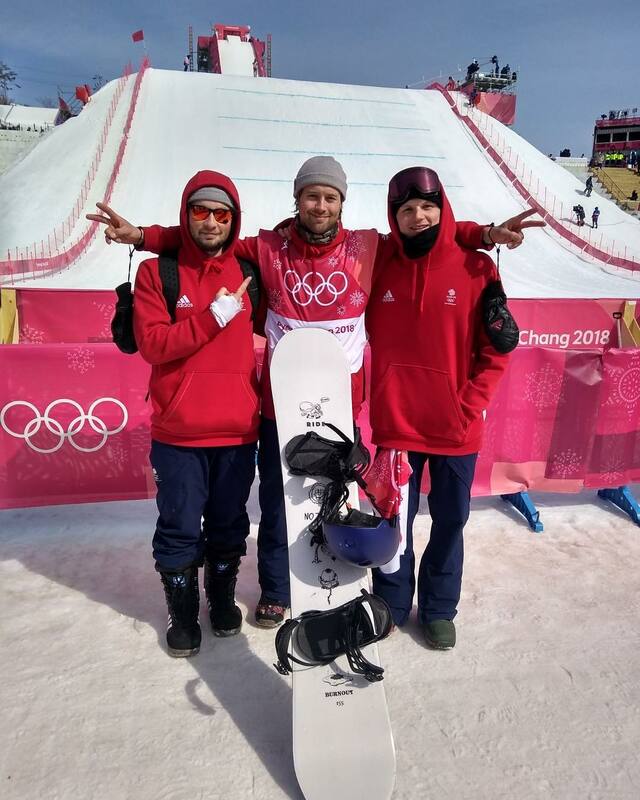 In the early hours of this morning Rowan and the other members of the GB Park and Pipe mens snowboard team competed in the Big Air competition. 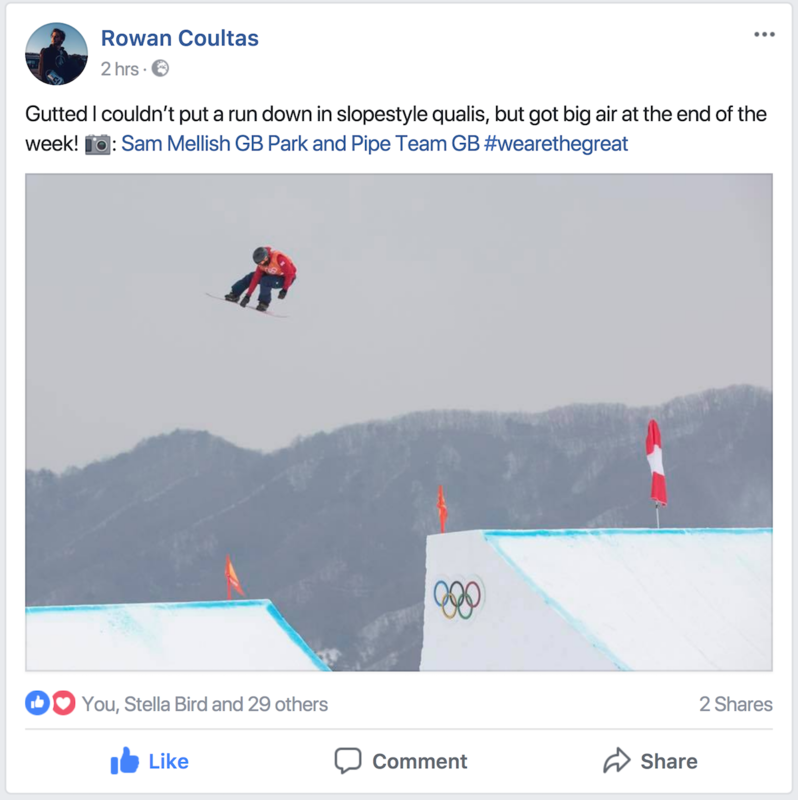 Rowan threw two amazing Backside 1440 Triple Cork jumps, which is a jump that incorporates 4 rotations around his horizontal axis and 3 somersaults before landing safely without putting a hand to the snow. 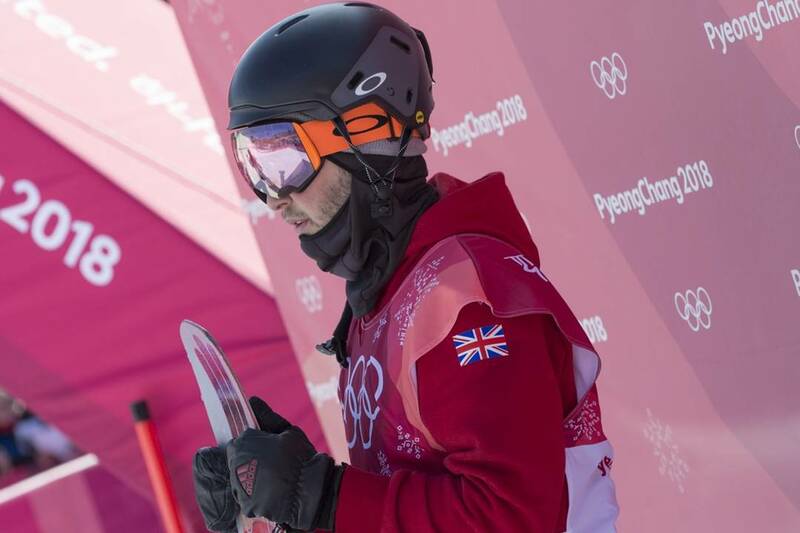 Despite scoring 84.50 in his final run he was pipped to a qualifying place by just 0.5 of a point. 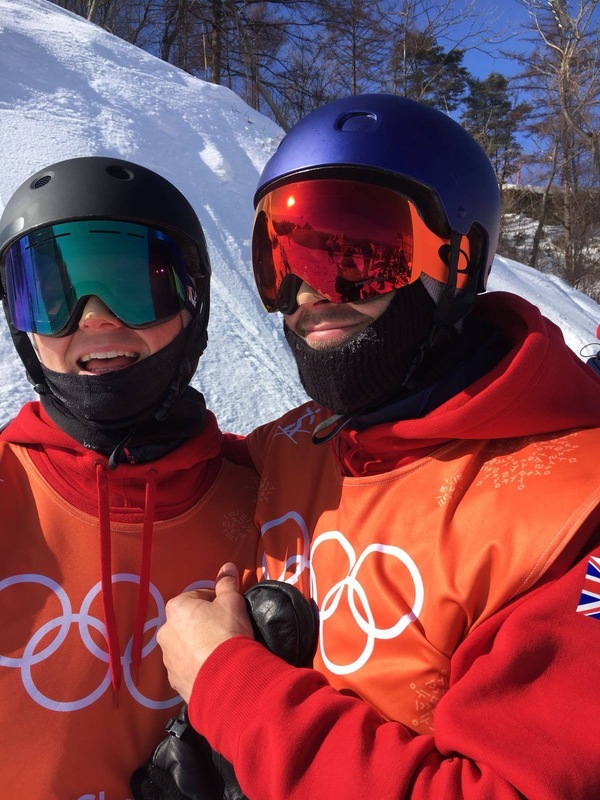 His team mate and training Billy Morgan partner did manage to progress to the finals in a nail biting heat 2, so watch out for him in the early hours of Saturday morning. 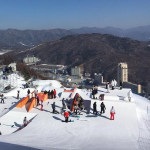 Click on an image below to see some photographs from the competition. 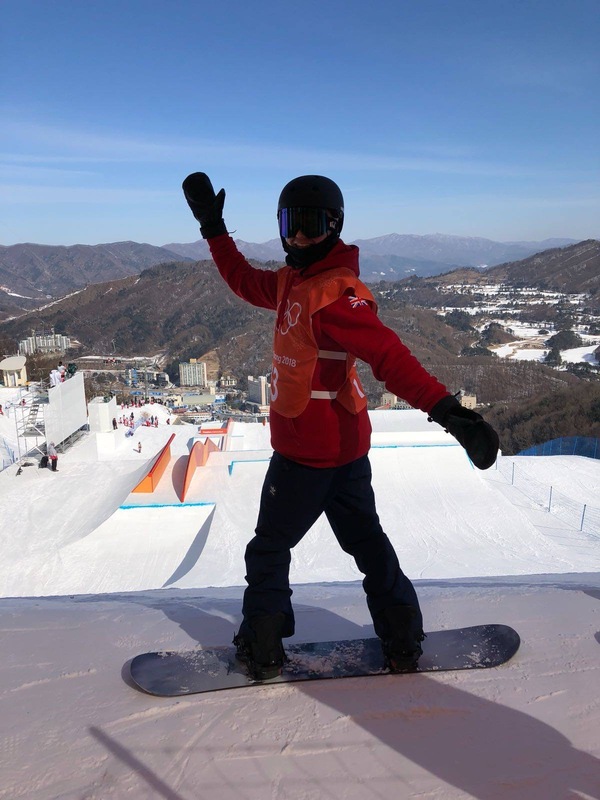 Rowan will be taking part in the Snowboard Big Air competition tonight which will be televised from 12:30am tonight on BBC One. 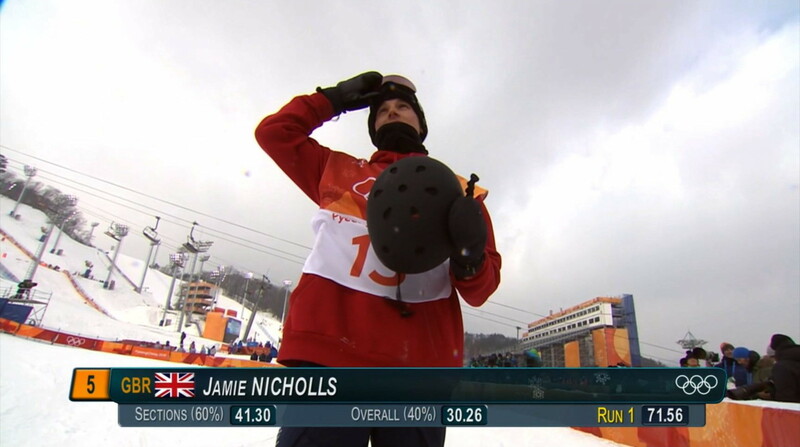 He will be in Heat 1 alongside the crème de la crème of snowboard Big Air specialist and drops in at number 17. 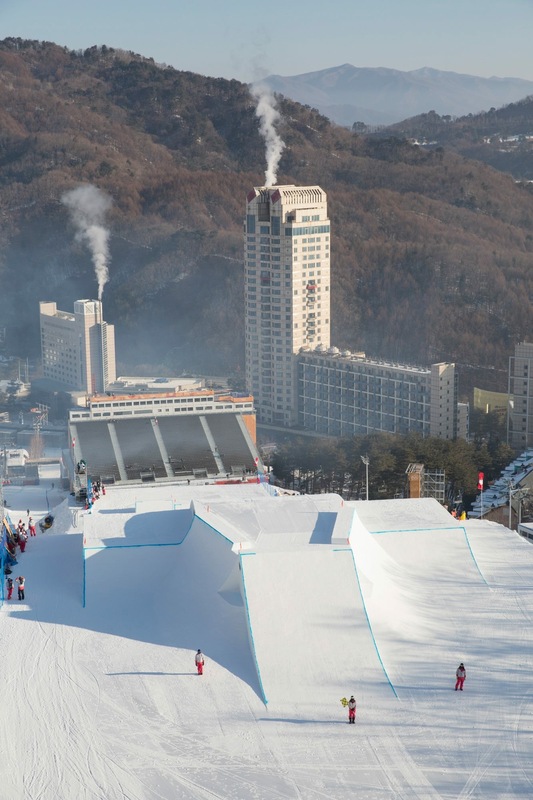 Big Air is a fairly apt description of this event, as the riders do get an impressive amount of air when going off the massive kickers used in these contests. 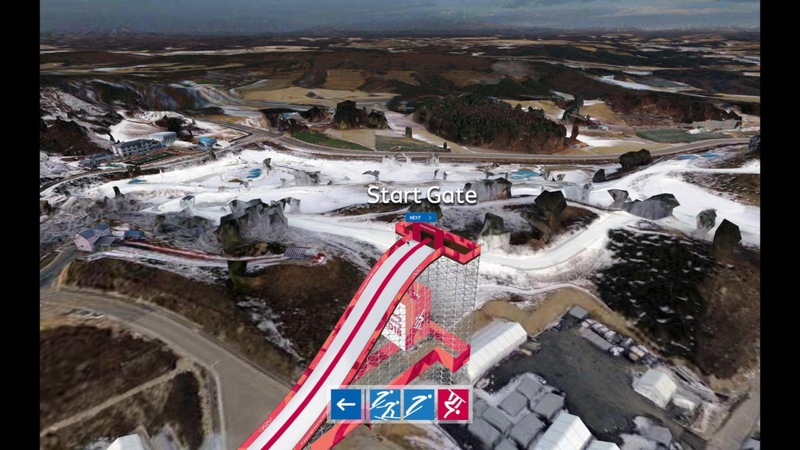 But it’s not so much the amplitude and distance that riders are being evaluated on here. 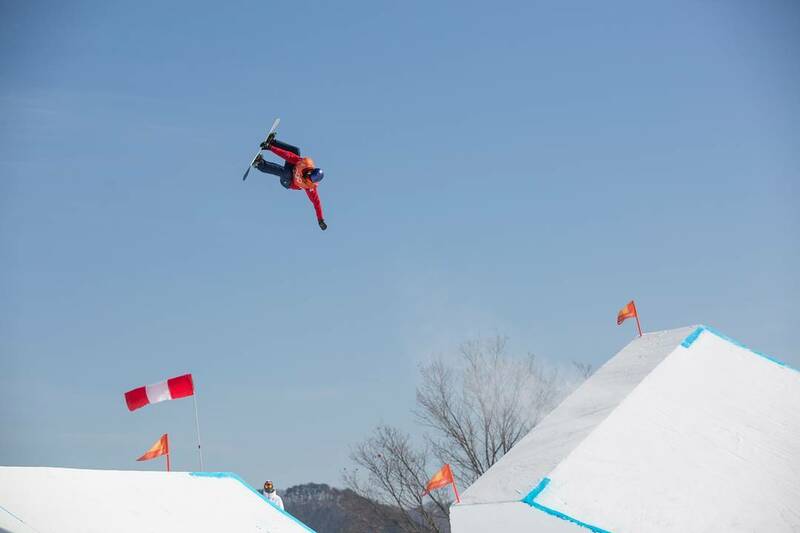 In the end, it comes down to using that air time to execute your best tricks. 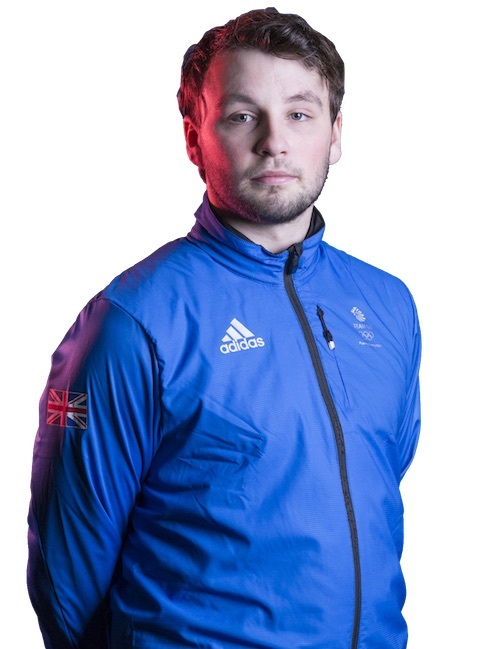 Team GB has 3 entrants for the event, Jamie Nicholls and Rowan who go in Heat 1 and Billy Morgan who goes in Heat 2. 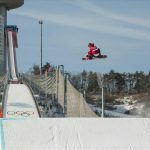 How is big air judged? 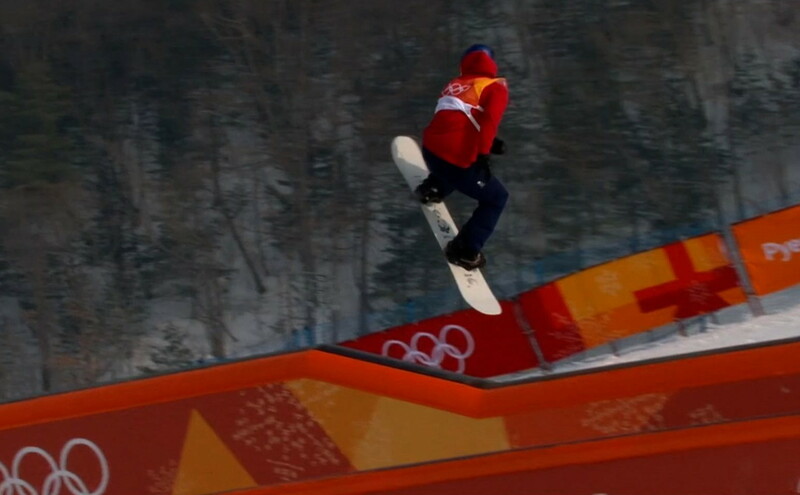 The technical difficulty of tricks is assessed. 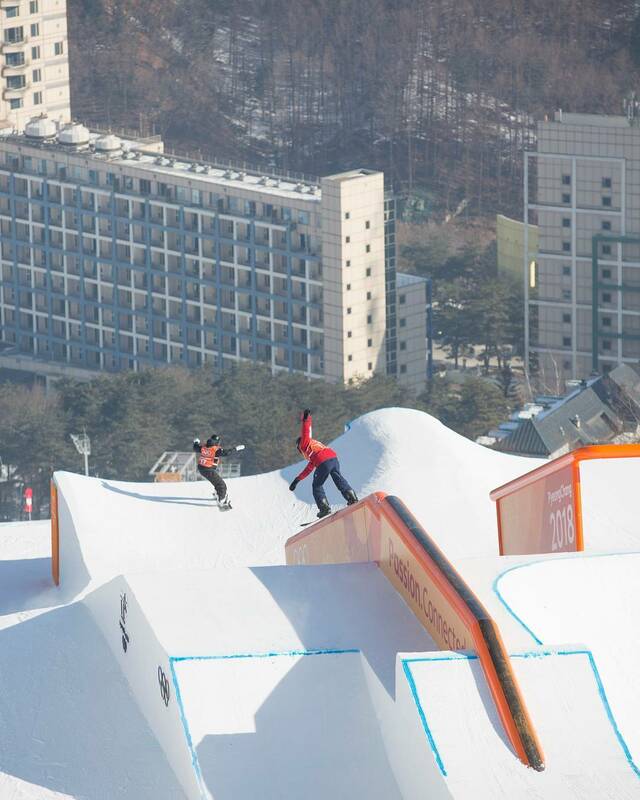 Generally speaking, tricks with more rotation are considered more technically difficult and will be rewarded as such. 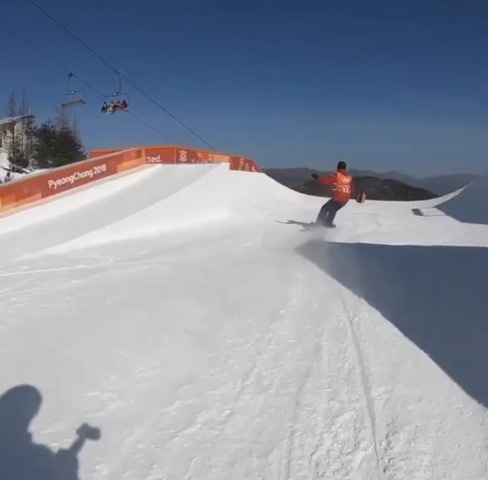 But there are other ways riders can increase the difficulty of a particular trick. 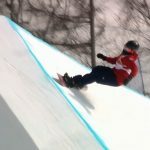 For example, an athlete may decide to take off or land switch when executing a trick, or they may do a more challenging grab to differentiate themselves from other riders in the field. 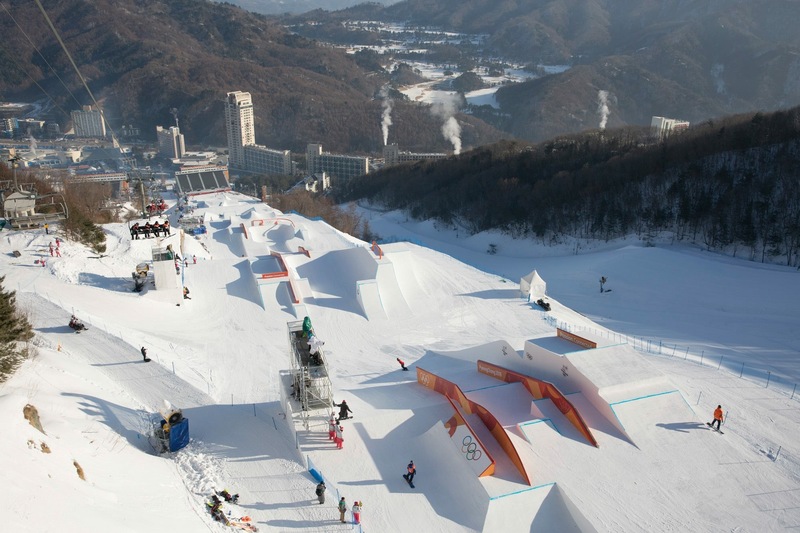 Progressive tricks that other riders aren’t doing will be rewarded. 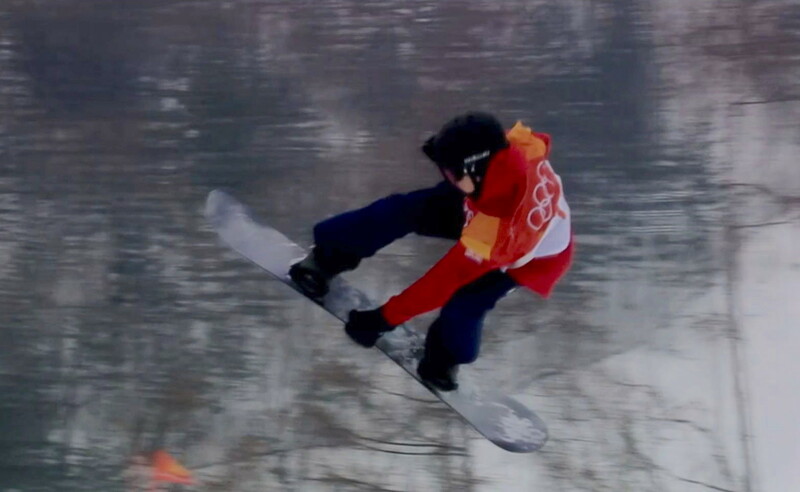 Control should be maintained throughout the whole trick, from take-off to landing. 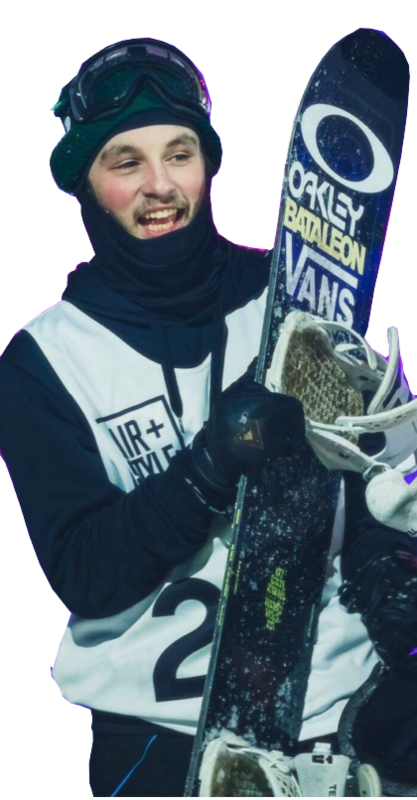 Grabs should be held properly and for as long as possible. 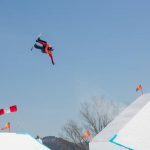 In big air, amplitude is not just about how big the athlete goes, but also landing the trick in the decided “sweet spot.” To have too much or too little amplitude on the jump can be dangerous and will be taken into account by the judges. 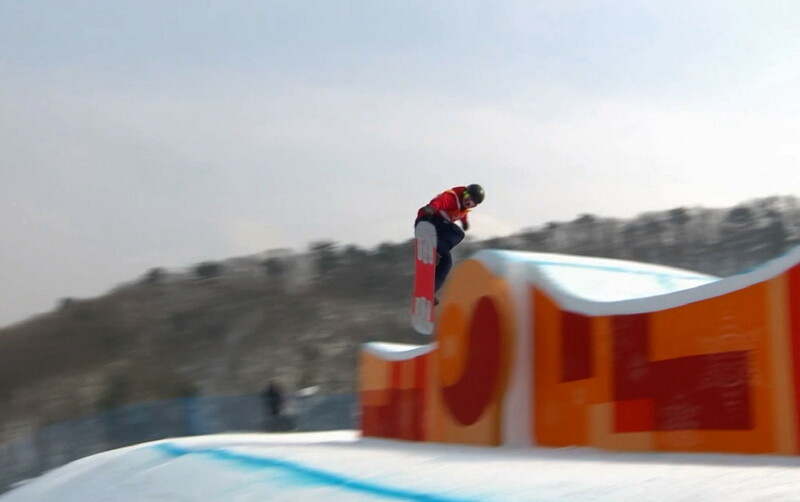 Riders must land with full control, with the trick already completed. 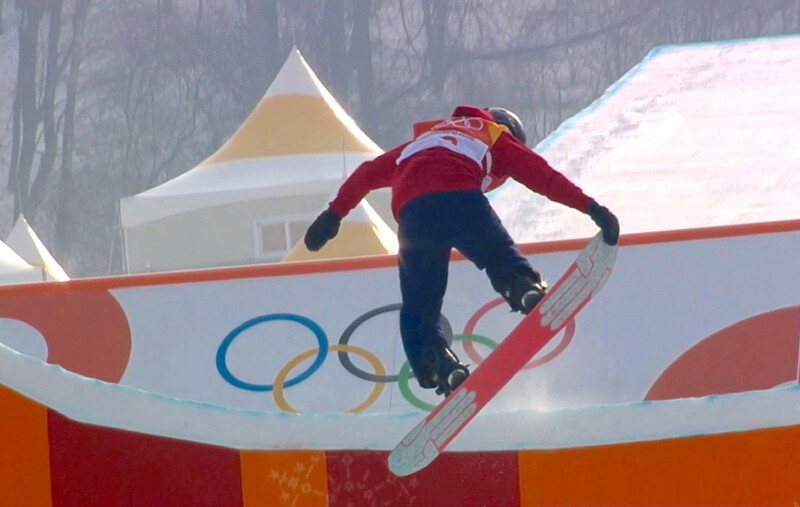 If a rider drags their hand on the ground or reverts while landing, that will be penalized. 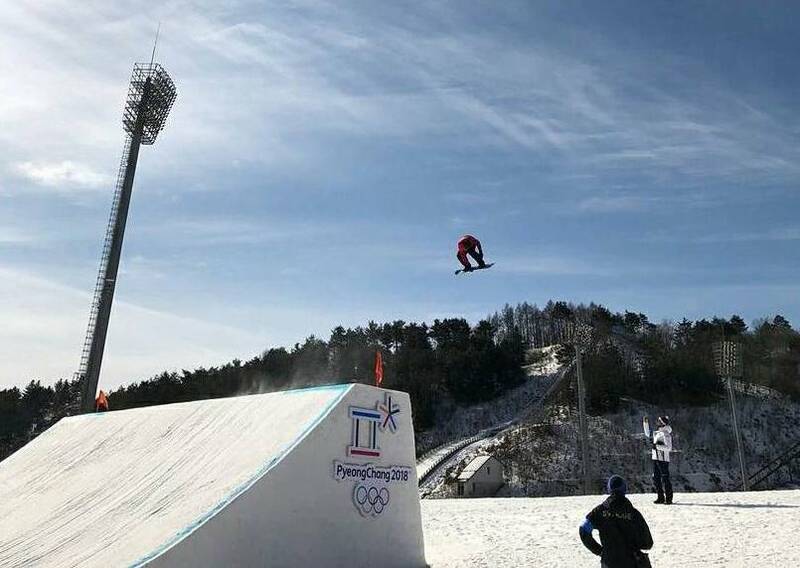 In the qualifying round at the Winter Olympics, each rider will have two attempts, and only their best score will count. 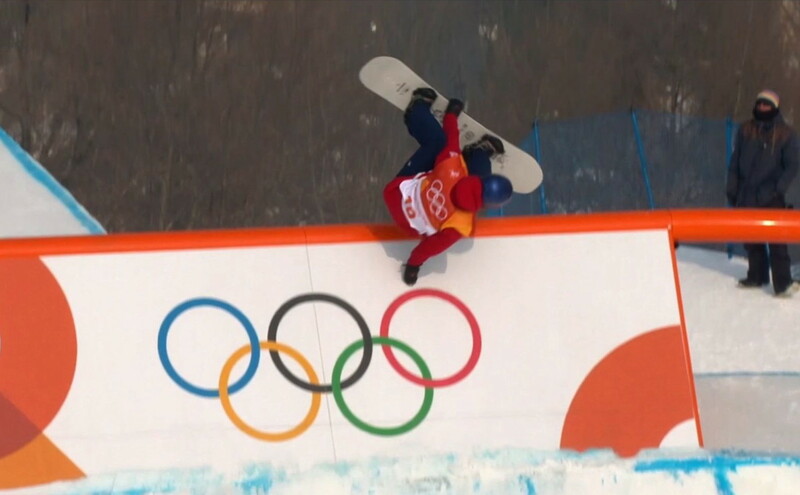 So riders just need to land their biggest, baddest trick one time. 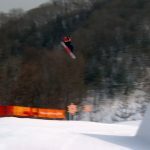 But things will get a little more difficult in the final, which will consist of three attempts. 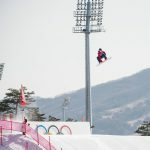 The scores from each competitor’s two best attempts will be added together to get the final results, and athletes must spin their tricks in different directions on those two runs. 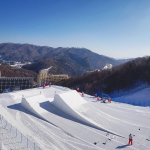 For example, if a rider spins a frontside rotation on one of those runs, they will need to spin a different rotation (backside, switch frontside or switch backside) on the other run. 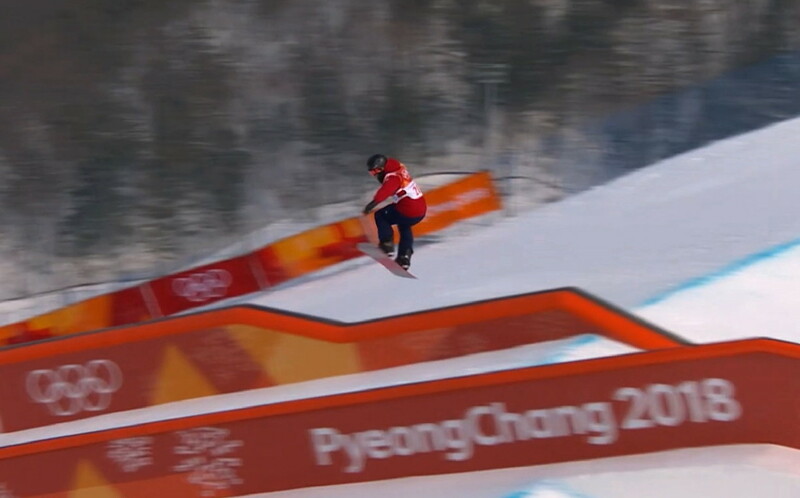 If a rider performs the same rotation more than once, then only the highest score will be counted. 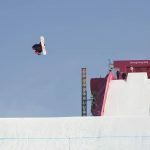 So not only do riders need to be a little more consistent in the final, they’re also going to have to show more variety. 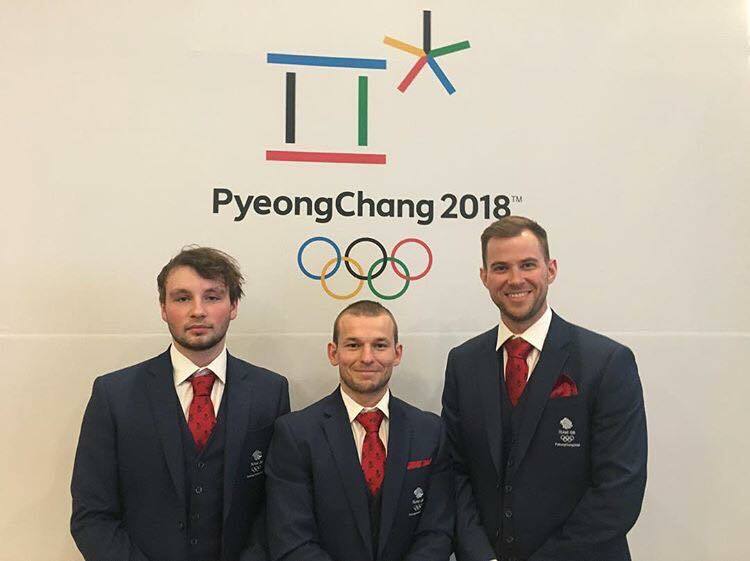 We wish all 3 lads the best of luck! 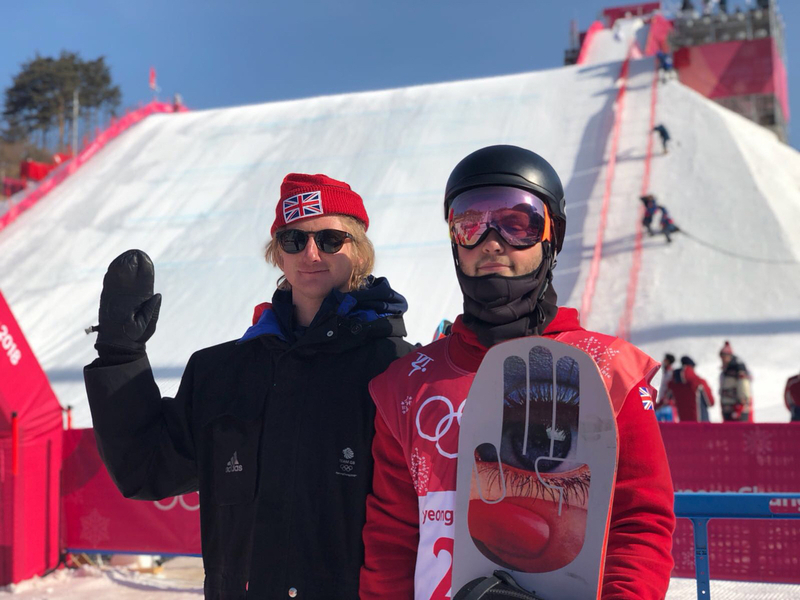 The team have spent the day supporting our Half Pipe crew before they jump in the Big Air competition on Wednesday morning. 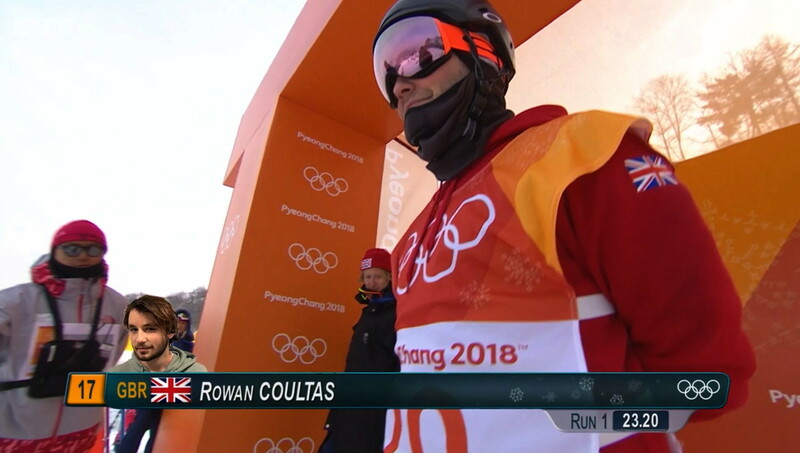 Here is Rowan with Murray Buchan. 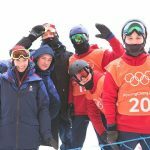 Mens Ski Slopestyle today and the team were out in force in support. 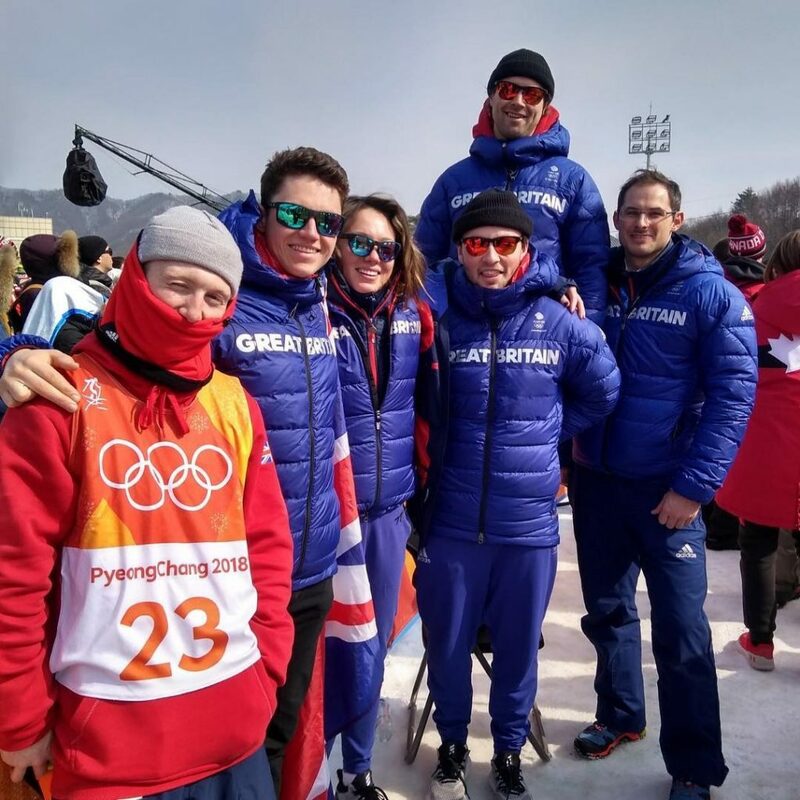 Here is Rowan with snowboard team mate Billy Morgan, Tyler Harding (another Olympic debutant in Ski Slopestyle), aerial skier Lloyd Wallace, Women’s Slopestyle Bronze Medallist Izzy Atkin and Skeleton Bronze Medalist Dom Parsons. 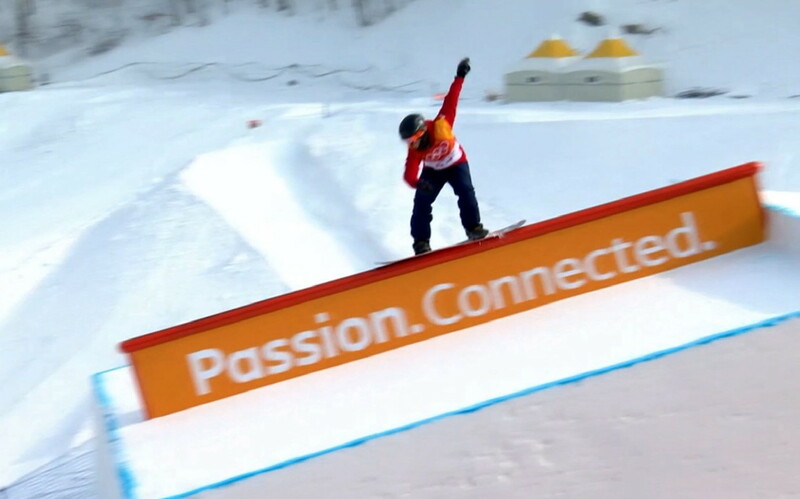 History was made today when Lizzy Yarnold became the first Britain to retain an Olympic Gold Medal. 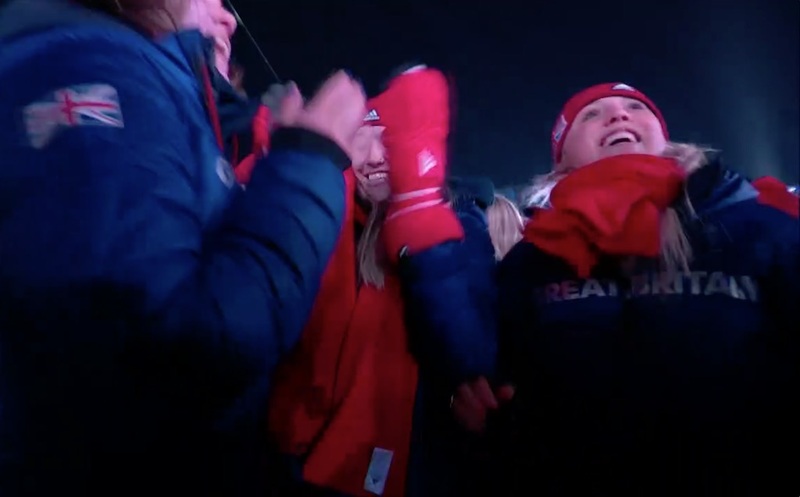 The Park and Pipe Team were also celebrating the amazing performance from an injured Kate Summerhayes and a fantastic Bronze Medal for Izzy Atkin in the womens ski slopestyle competition. 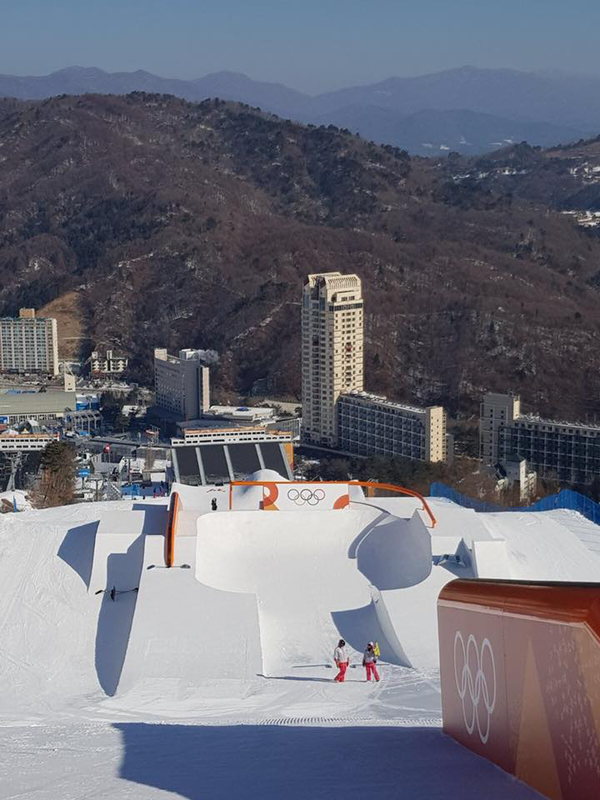 The snowboard team were hard at work training for the Big Air competition and the picture below shows the view from the top of the jump. 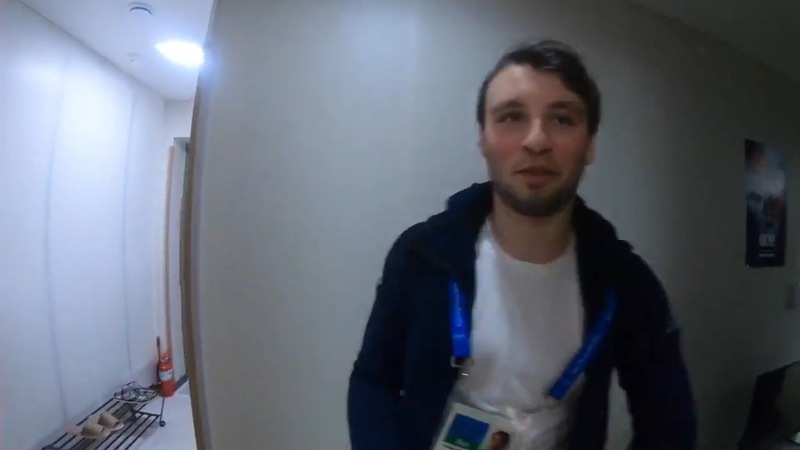 They were busy with their video cameras too. 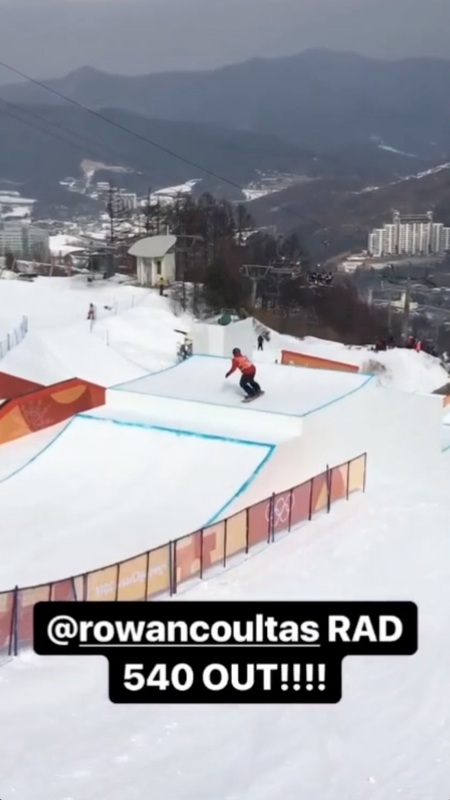 Click on the video below to see one of Rowan’s practice runs. 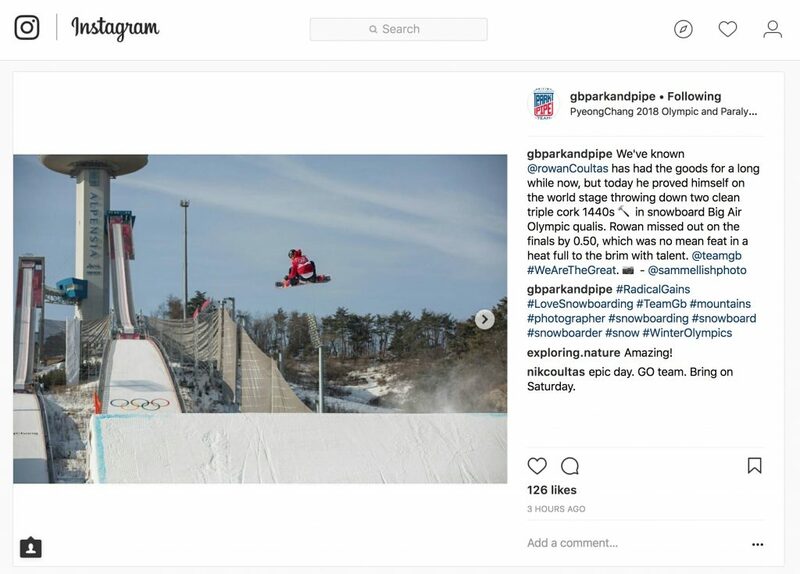 In it he shows the backside, 1440, triple cork., the same trick that Red Gerard finished his Olympic Gold Medal Slopestyle run with. 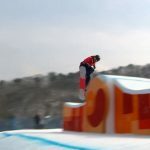 So thats 4 spins and 3 somersaults in the same jump! 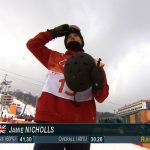 Click on the video below to see some amazing footage of the jump from Jamie Nicholls head camera as Aimee Fuller follows him down the jump. 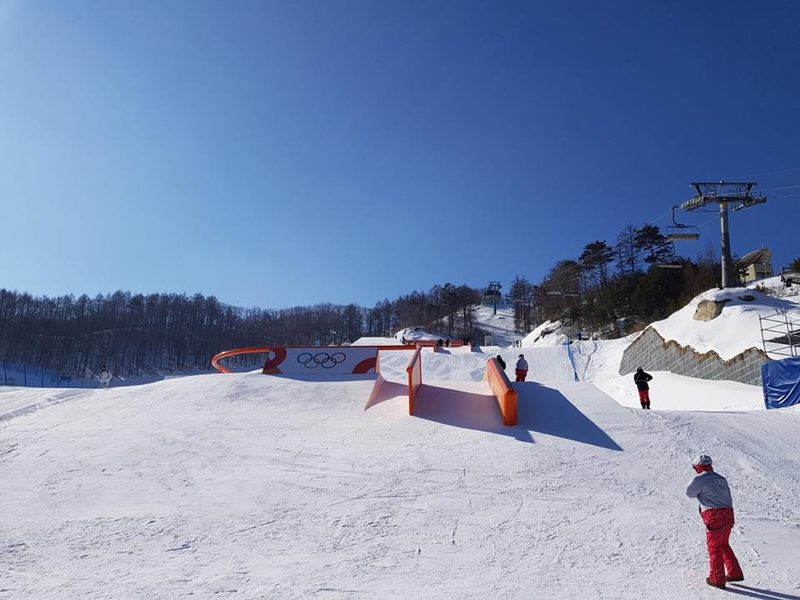 It was the first day of training on the Big Air jump at the Alpensia Jumping Centre. 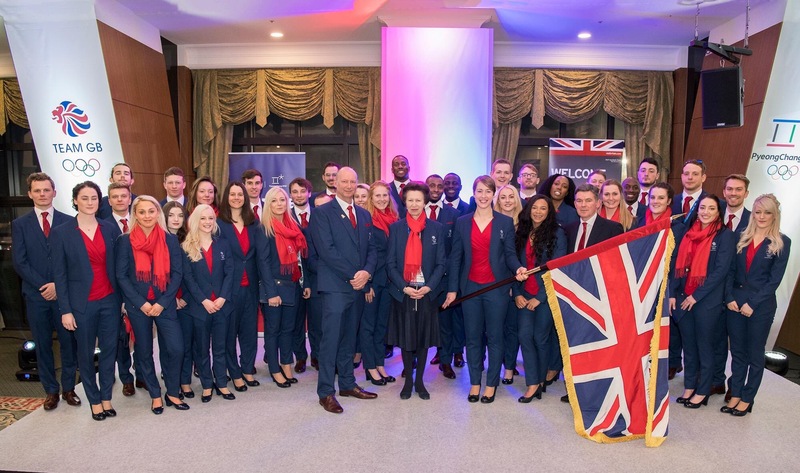 Click on an image below to see some of the team. 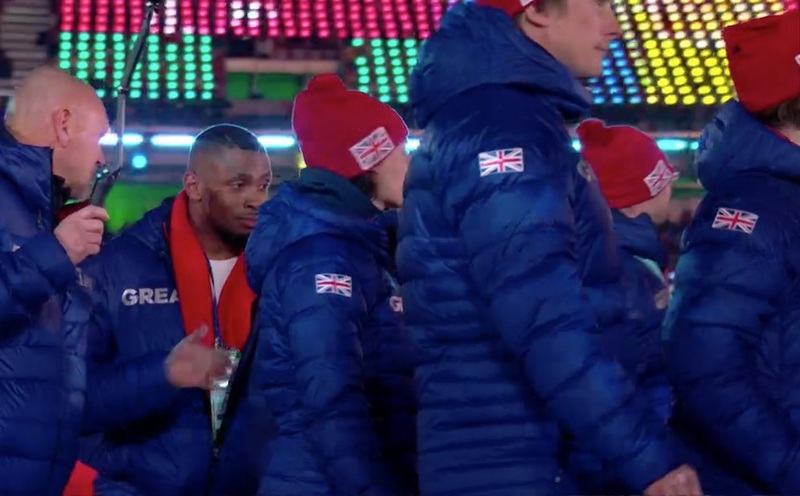 They also took part in a fun competition on the BBC. 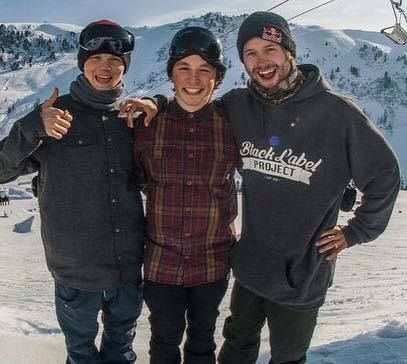 Click the video to see how they got on. 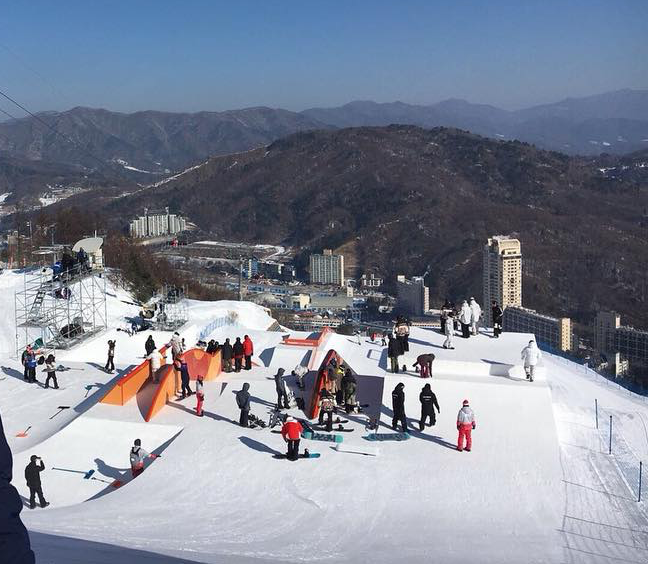 The team have been at the Alpensia Jumping Centre today to look at the Big Air jump before practice starts tomorrow. 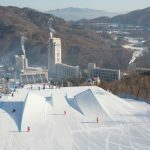 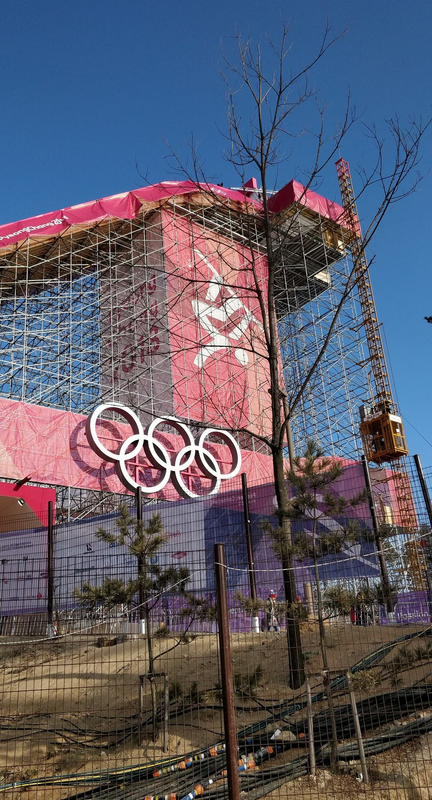 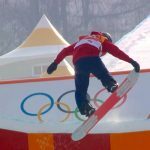 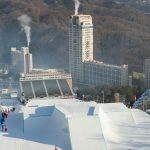 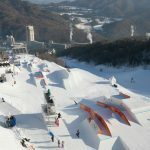 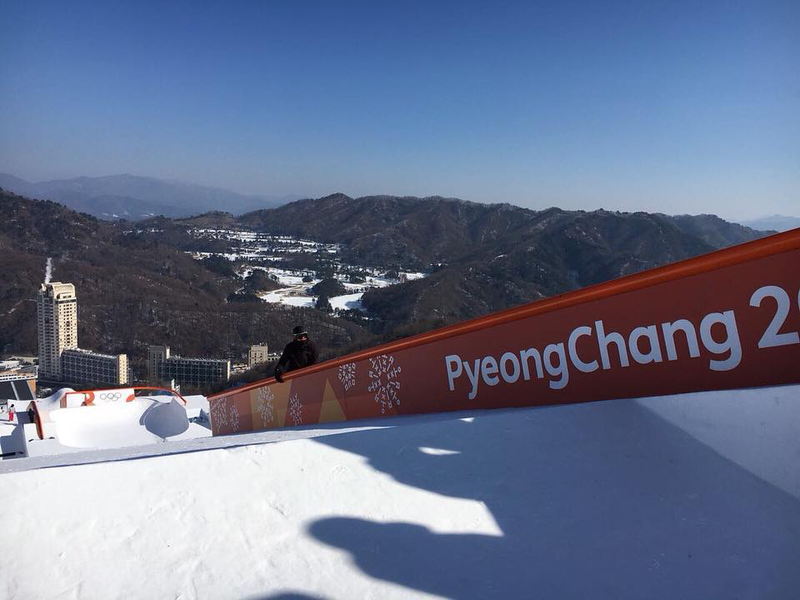 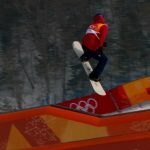 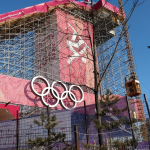 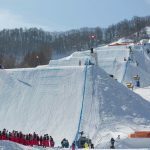 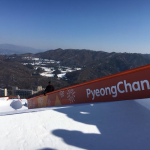 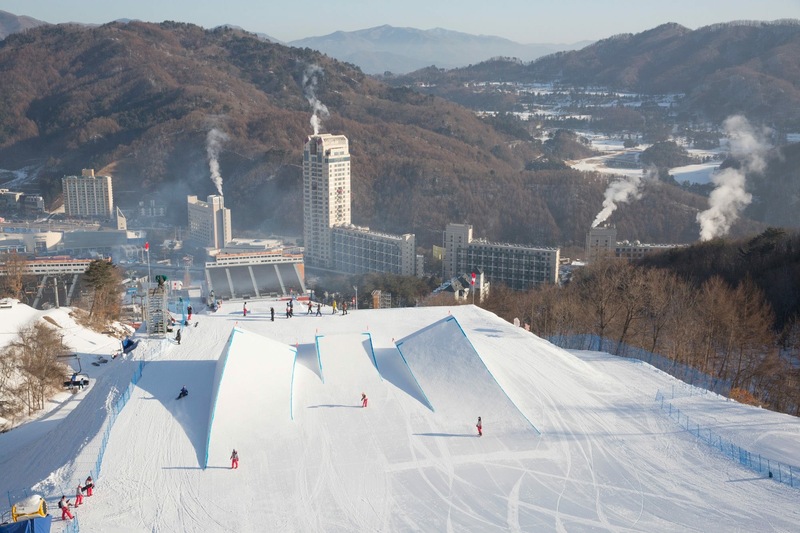 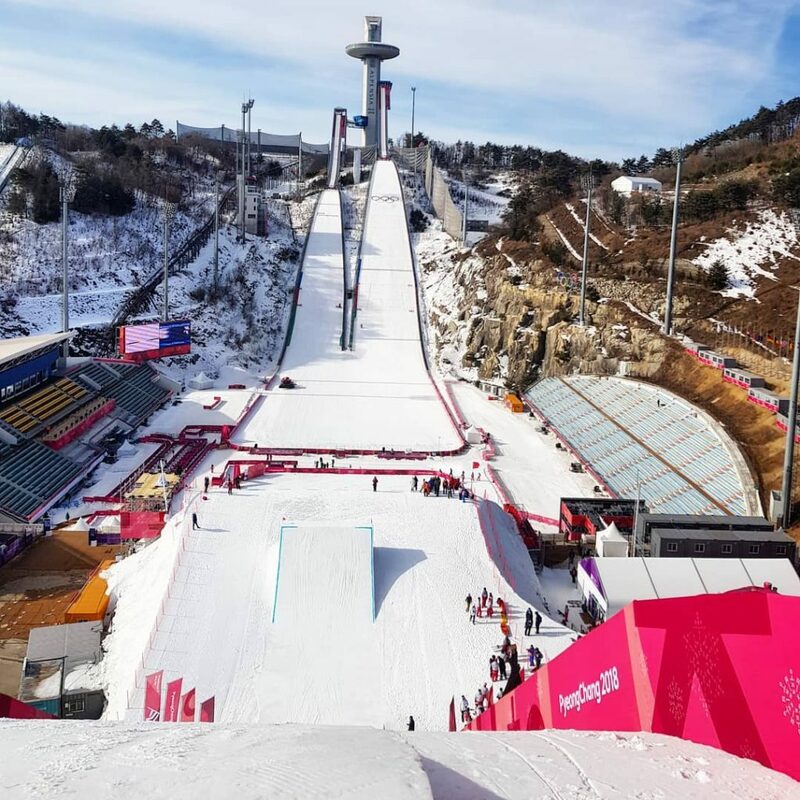 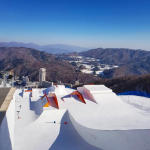 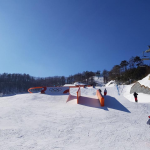 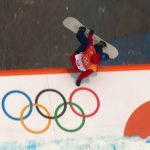 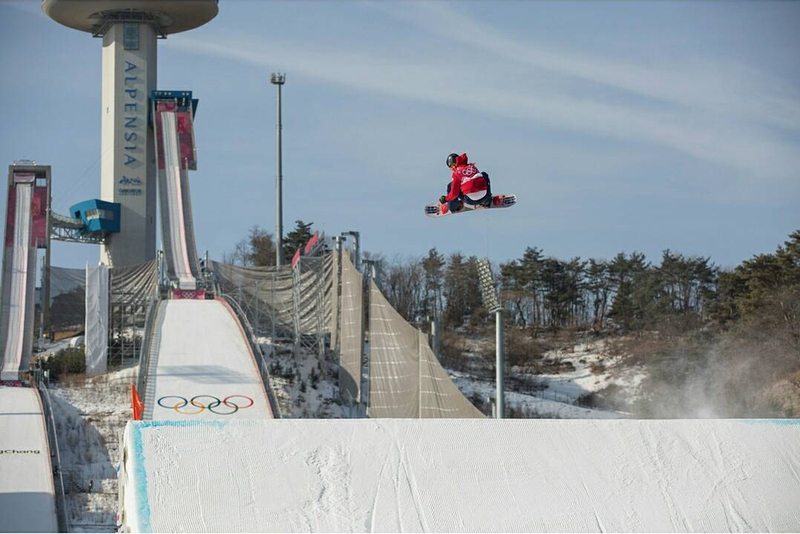 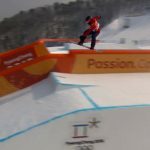 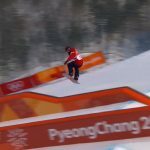 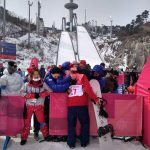 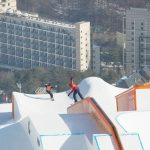 The newly built venue in PyeongChang has a Big Air with total height from start to finish reaching 49 meters and maximum slope angle of 40 degrees, allowing the athletes more time in the air to show off their techniques. 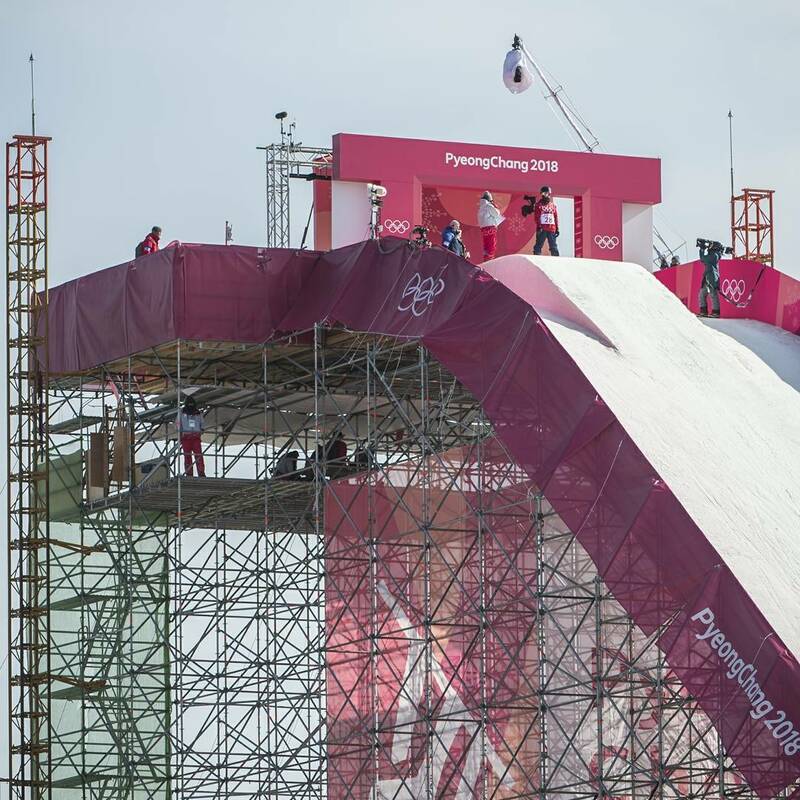 Click the animation below to see what they will be jumping from. 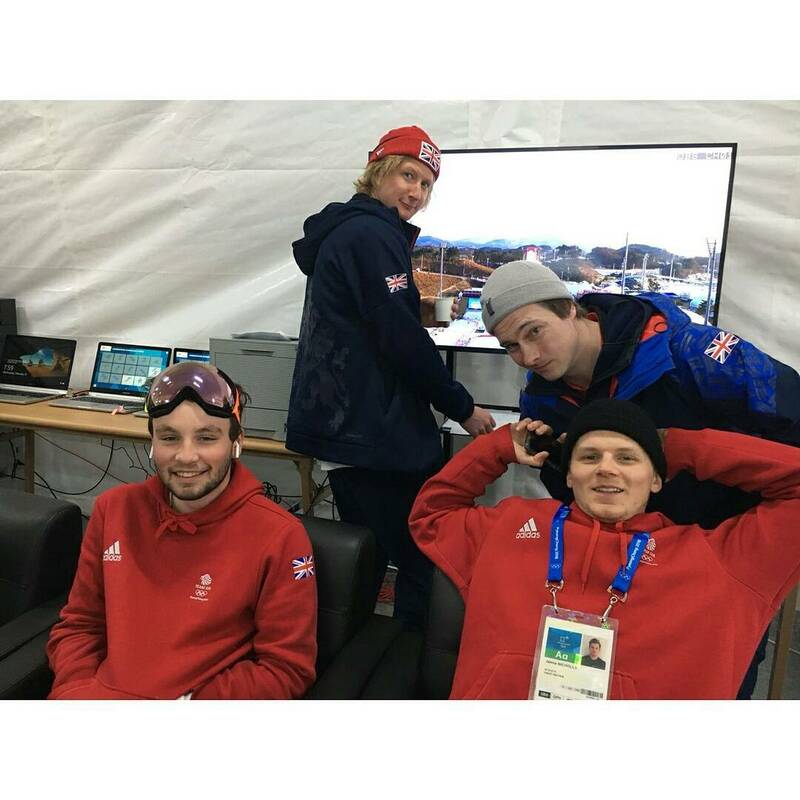 The team were relaxing today. 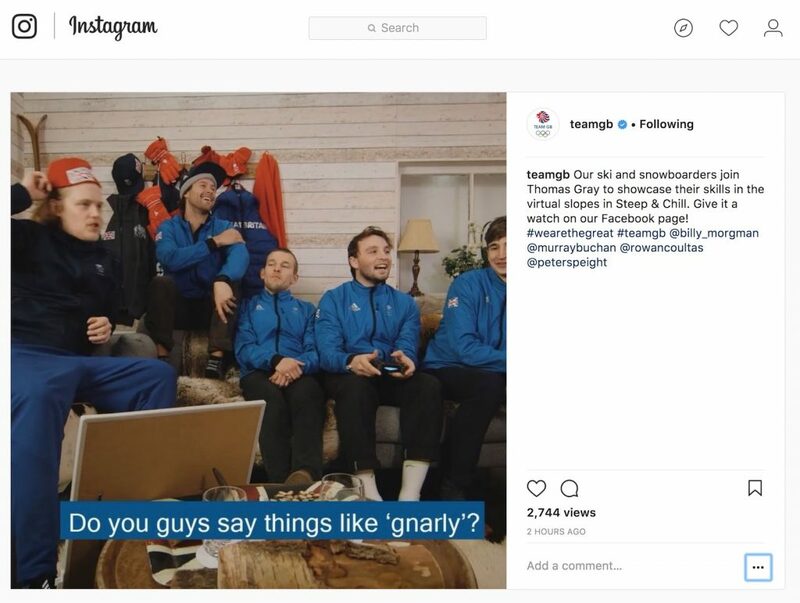 Click the post to see what they were up to. 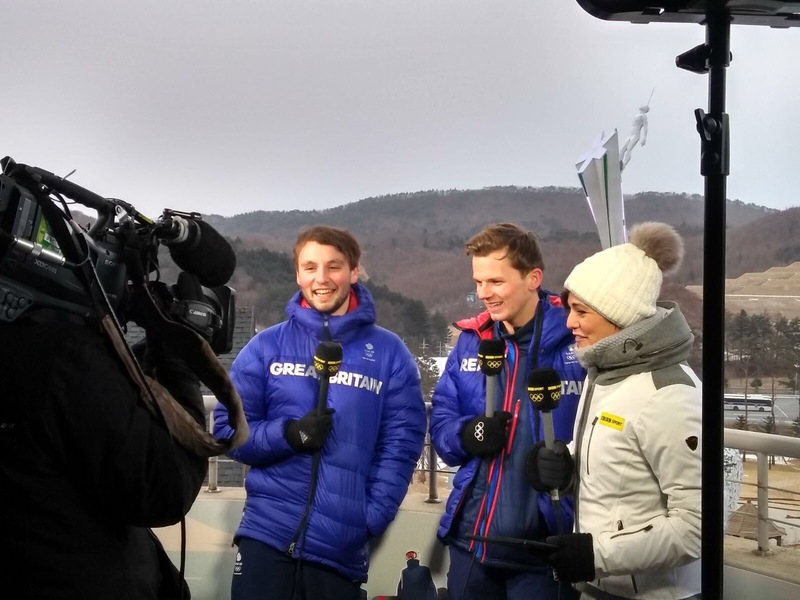 Eurosport caught up with Rowan and Jamie Nicholls today whilst they were out and about. 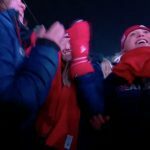 Click the video to see how they got on with the 60 second miming challenge. 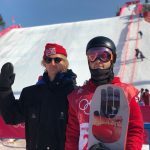 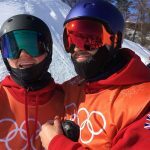 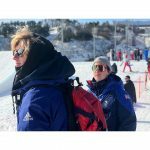 The Mens Slopestyle Finals took place today and Rowan and Jamie Nicholls were very busy making a number of appearances on BBC TV and Radio. 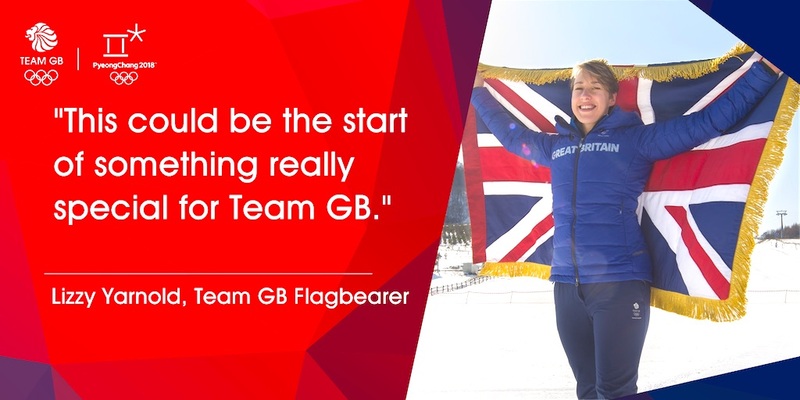 Rowan was also surprised to speak to his former Geography teacher from Mounts Bay, Mrs Wheatley, who is now working for BBC Radio Cornwall. 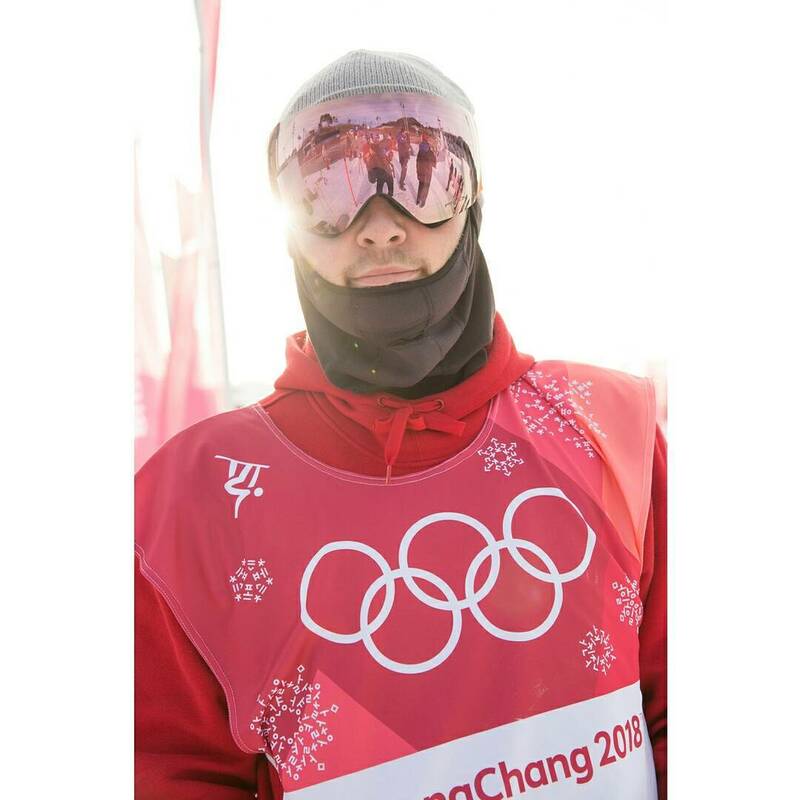 Click on the recording below to hear his interview. 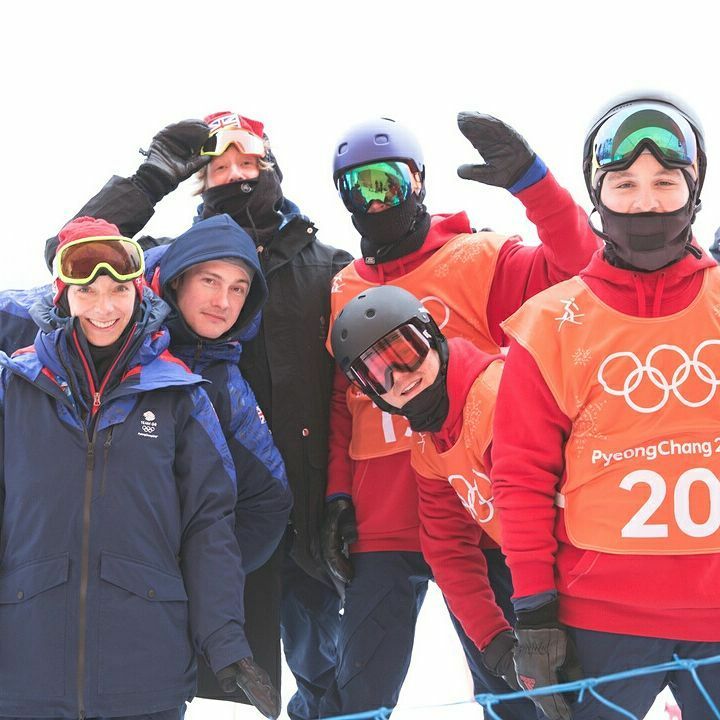 The Mens Slopestyle Competition took place in difficult conditions for all of the riders with Jamie Nicholls in Heat 1 and Rowan starting in Heat 2 alongside Billy Morgan in a such a strong group it was described by commentators on the day as “the group of death”, with only the top 6 athletes going through to the final from each heat. 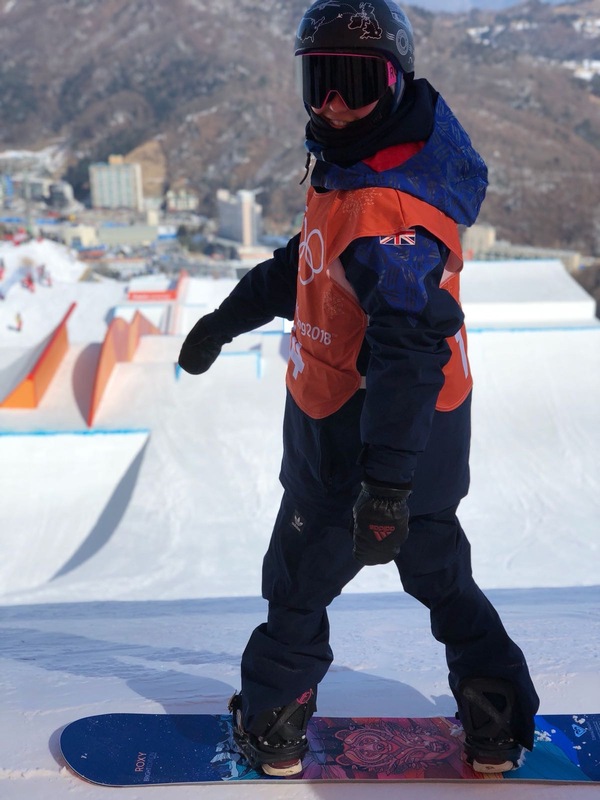 Unfortunately none of our GB Park and Pipe team made it through qualifications to the finals with Jamie coming the closest and losing out on a place through some “contentious” scoring. 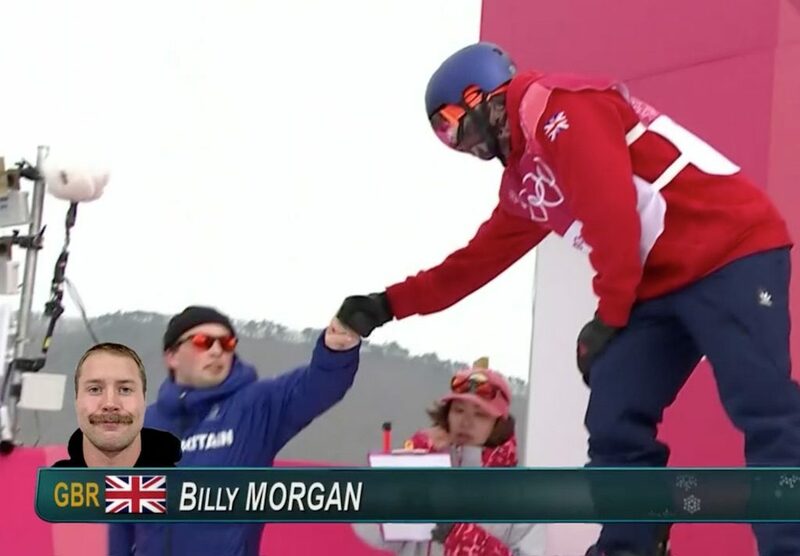 Speaking afterwards on the Team GB news feed Billy said ” I’m pretty gutted. 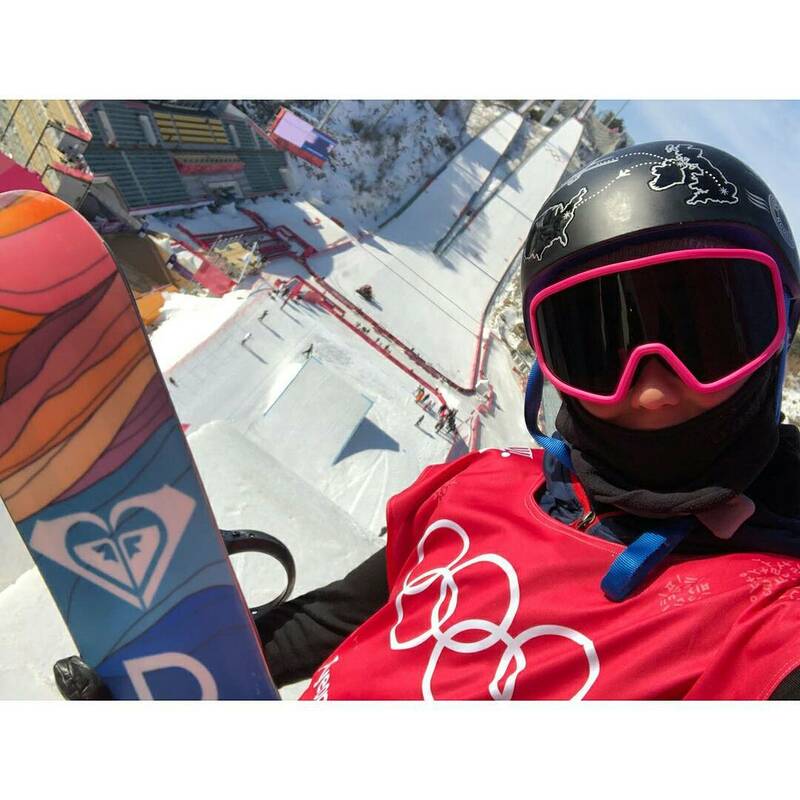 I had a really strong practice and I went in feeling good and chilled. 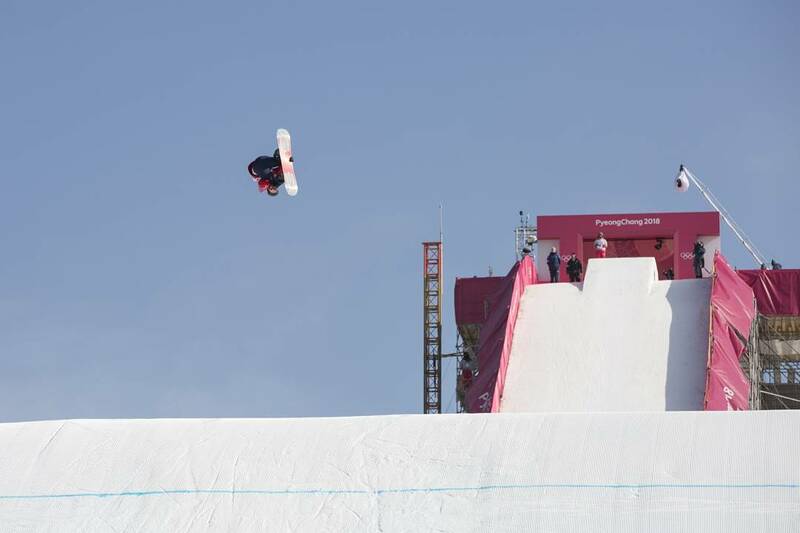 I think we can all take it forward in the Big Air. 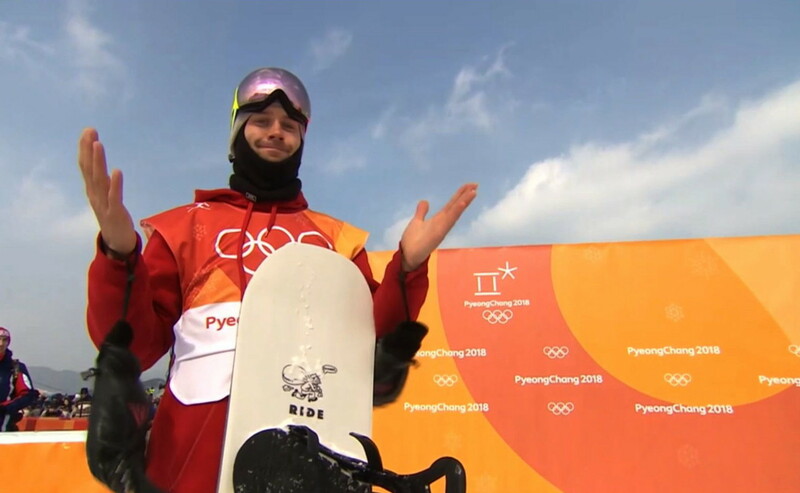 Hopefully we’ll be able to turn around some of the luck we had”. 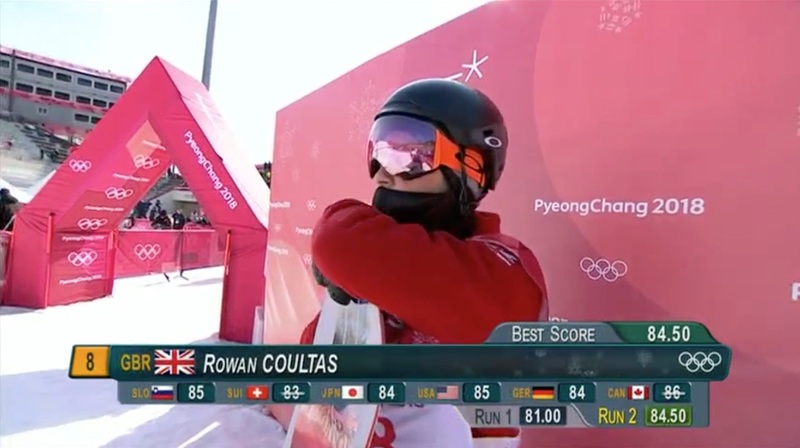 Rowan also admitted his disappointment saying” I’m gutted. 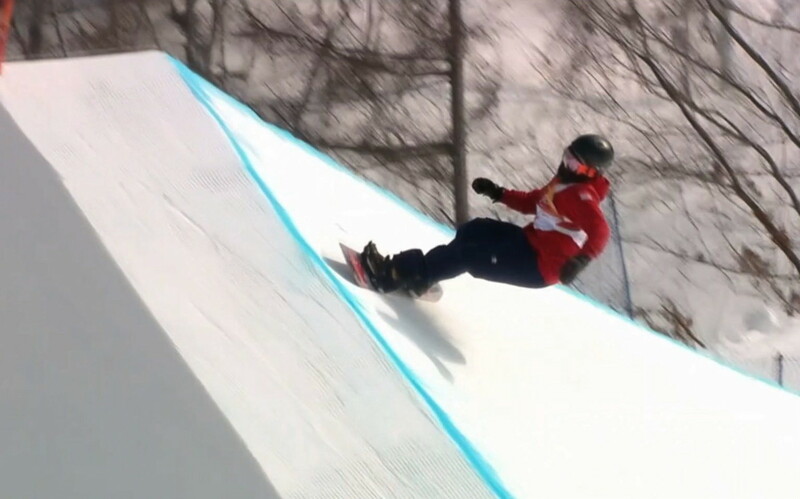 I just wanted to land a run and just be stoked on it. 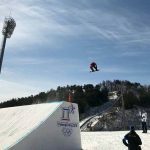 I fell on a trick that I’m normally pretty strong at. 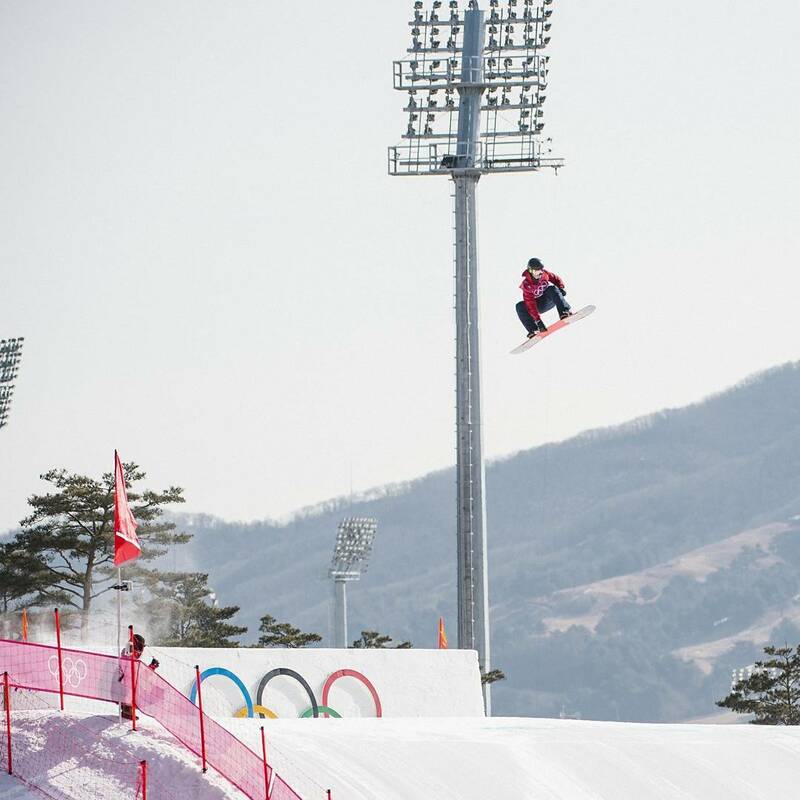 I’ve landed it quite a few times in training but I didn’t get it right.” Coming into qualification I was really happy about my riding. 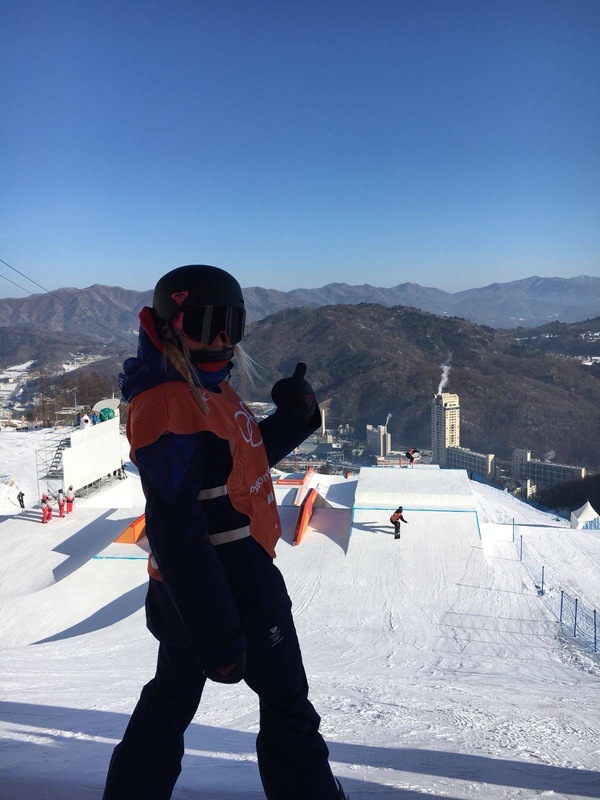 My training went really well and I was just ready to do it in competition”. 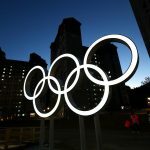 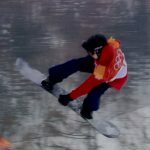 The three men will be taking a few days rest before resuming training for the Big Air event at the end of the competition. Click on an image to see a few pictures of their runs. 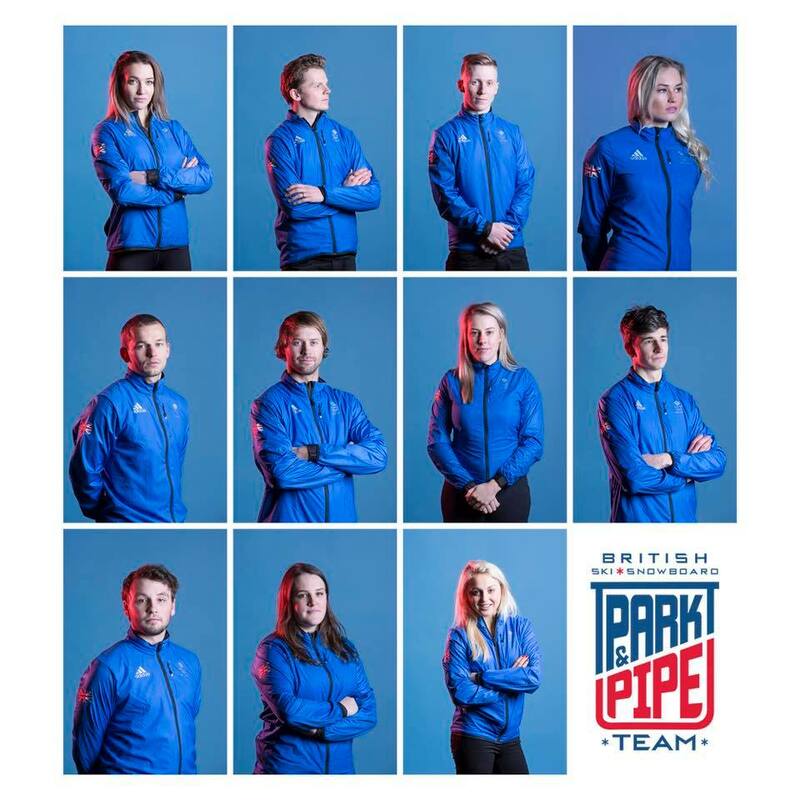 The last 24 hours have been a hectic meeting the press, attending events, meeting celebrities and practice for Rowan and the GB park and Pipe Team as they prepare for their first events. 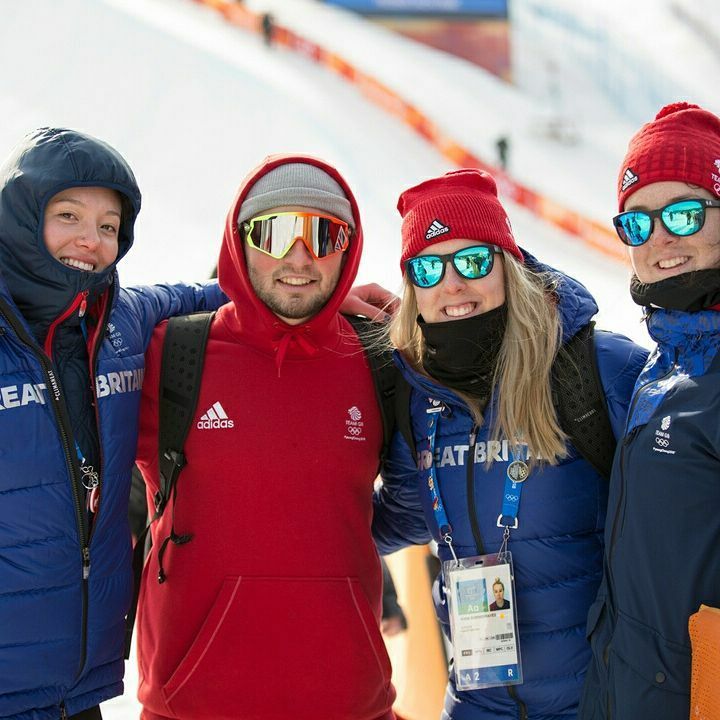 After hearing the heartbreaking news that one of the team, Katie Ormerod, had been ruled out of the Olympics after sustaining a broken wrist and heel in training, they donned their suits for an official Welcome event attended by the Princess Royal before another early start today for one last practice session on the slopestyle course. 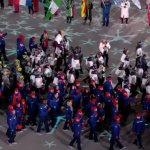 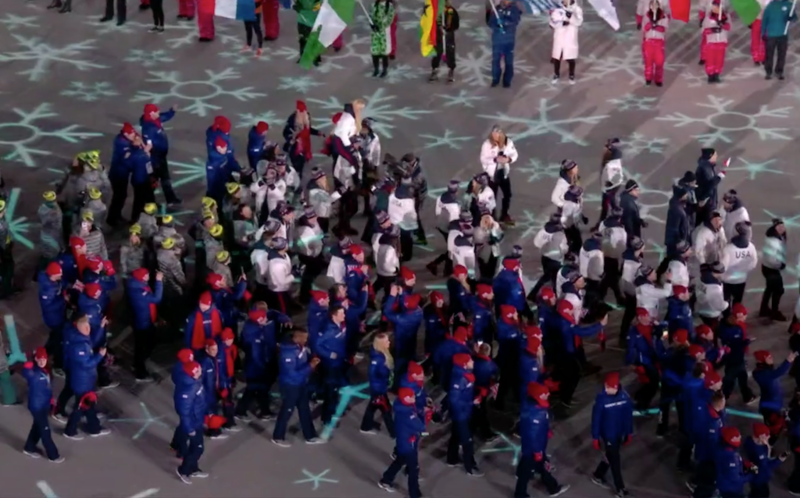 They then got ready to attend the spectacular Opening Ceremony, a celebration of Korean culture and Olympic achievement. 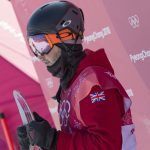 Unfortunately Rowan, Billy Morgan and Jamie Nicholls were unable to attend as they will be having a really early start for today’s Mens Slopestyle competition and would not have made it back in time to compete. 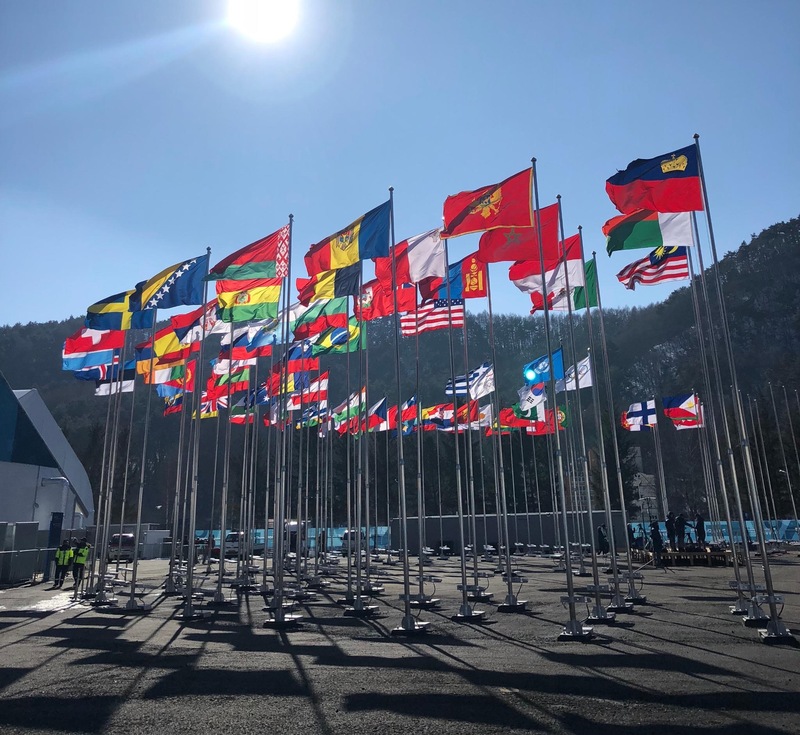 Click on an image to see a few pictures from the last 24 hours. 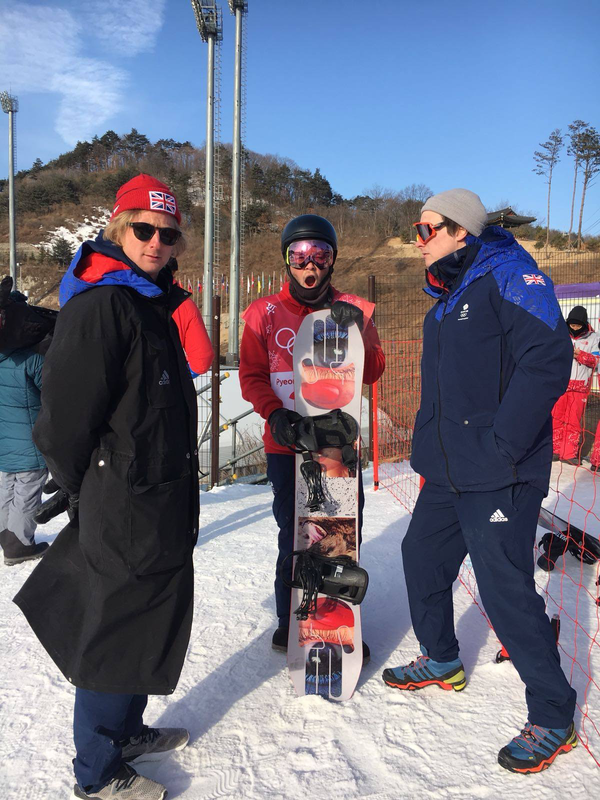 Click the video below to see a video of their last practice session made for the team by Tim Warwood, Ed Leigh and Sochi 2014 Bronze medalist Jenny Jones. 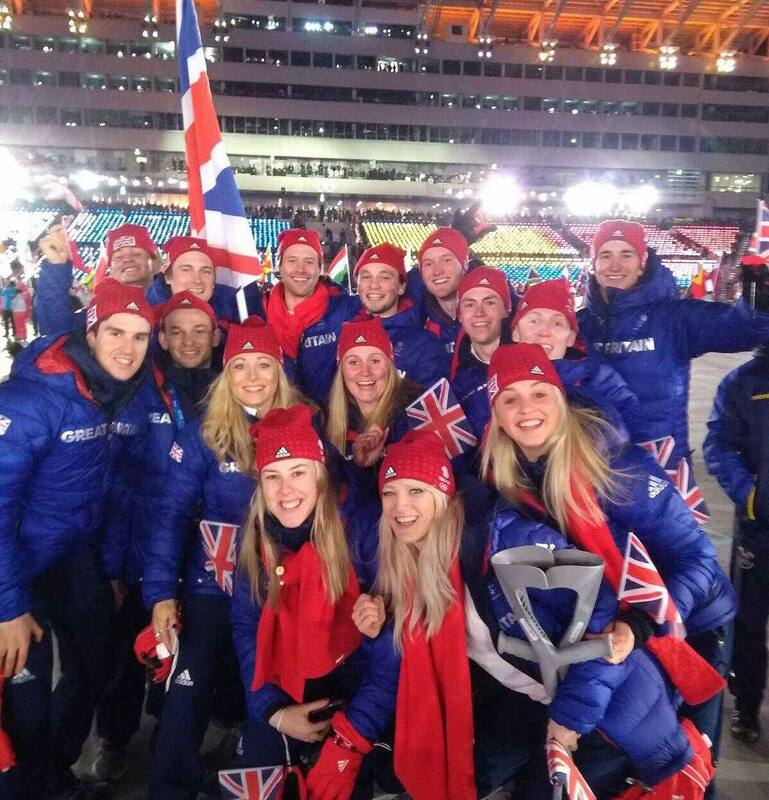 You can watch the whole competition “live” on BBC One from around 12:30 am. 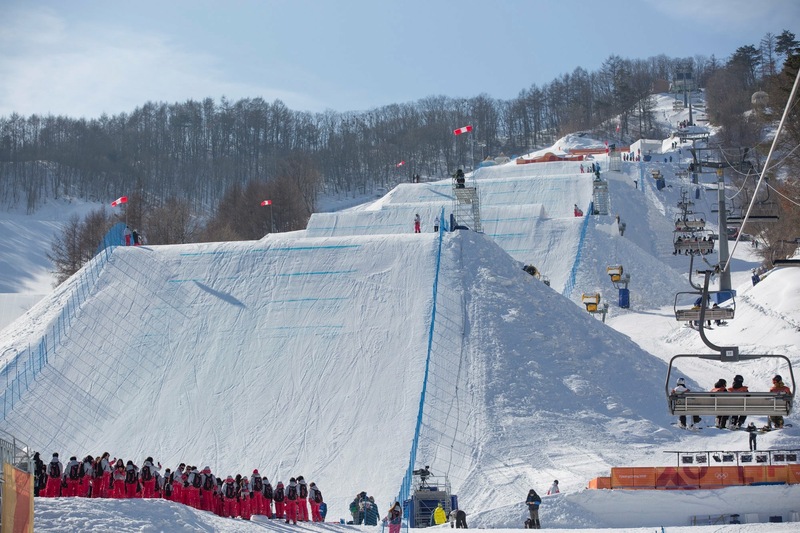 The qualification round will be split into two heats, with two runs for each competitor in each heat. 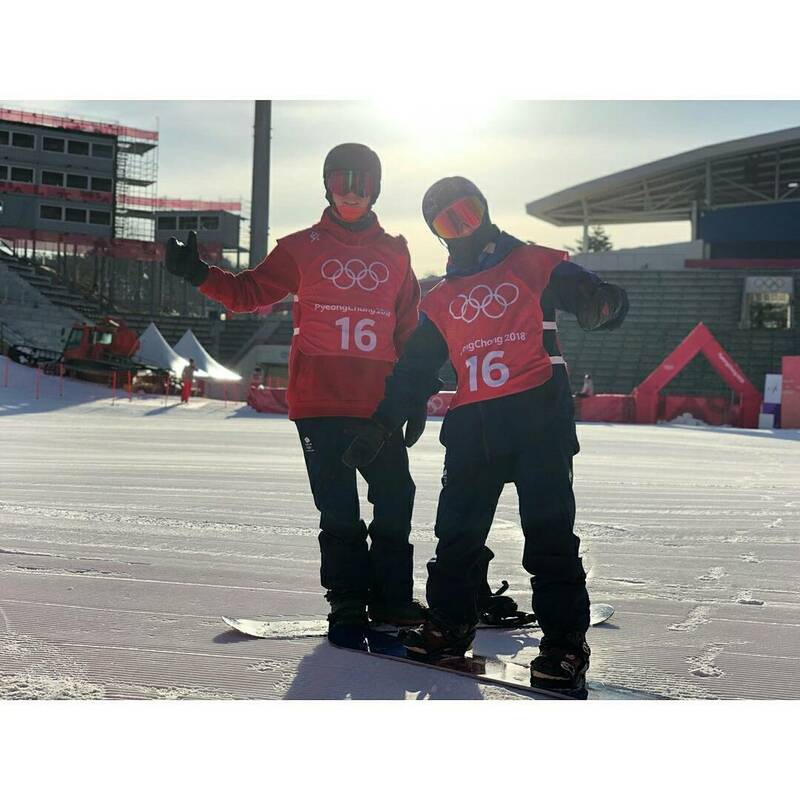 Jamie will be in Heat 1 and Rowan and Billie will be taking part in Heat 2. 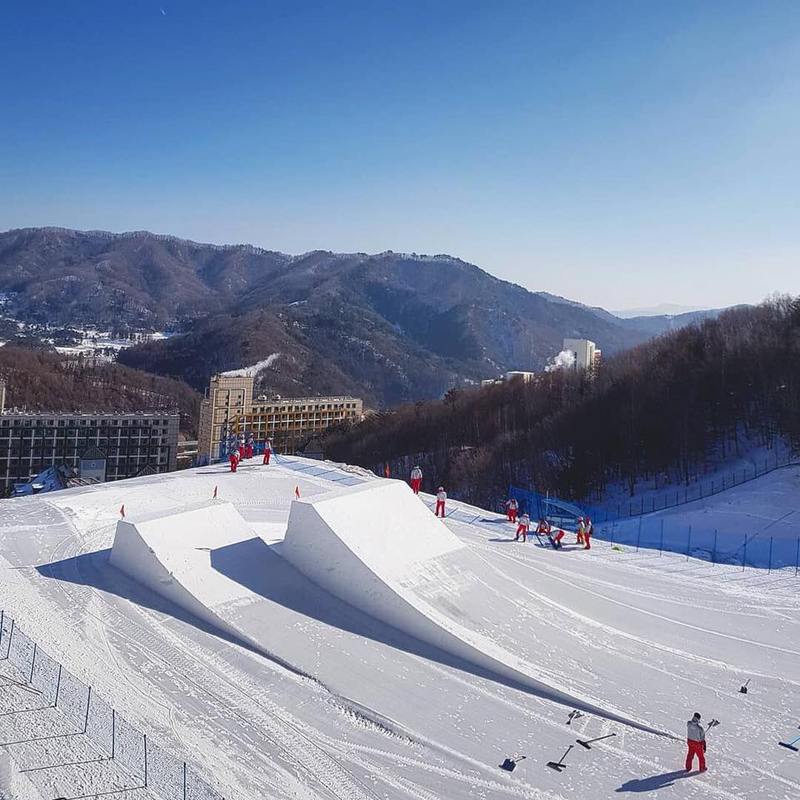 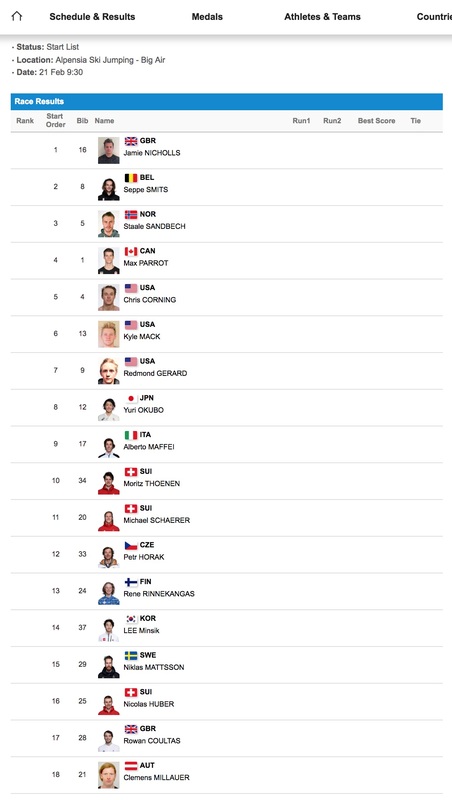 The top 6 riders from each heat will then contest the final on Sunday before Aimee Fuller makes her appearance in the Ladies Slopestyle competition later in the day. 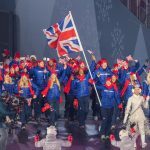 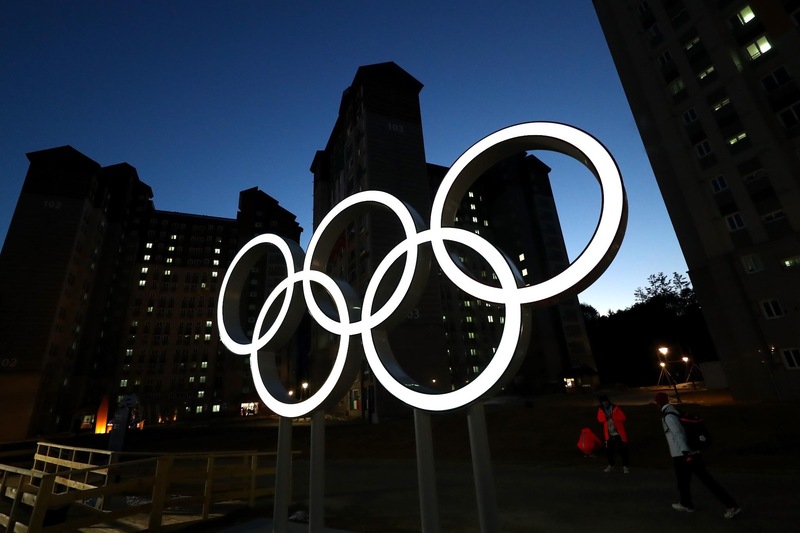 The Opening Ceremony for the 2018 Winter Olympics is now only one day away and Team GB have announced that the flag bearer for the ceremony will be the defending Skeleton champion Lizzy Yarnold. 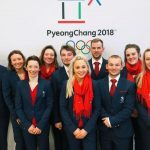 The 29-year-old was selected by her GB team-mates for the honour and she is aiming to become the first Briton to defend a Winter Olympic title when she competes at Alpensia Sliding Centre on 16 and 17 February. 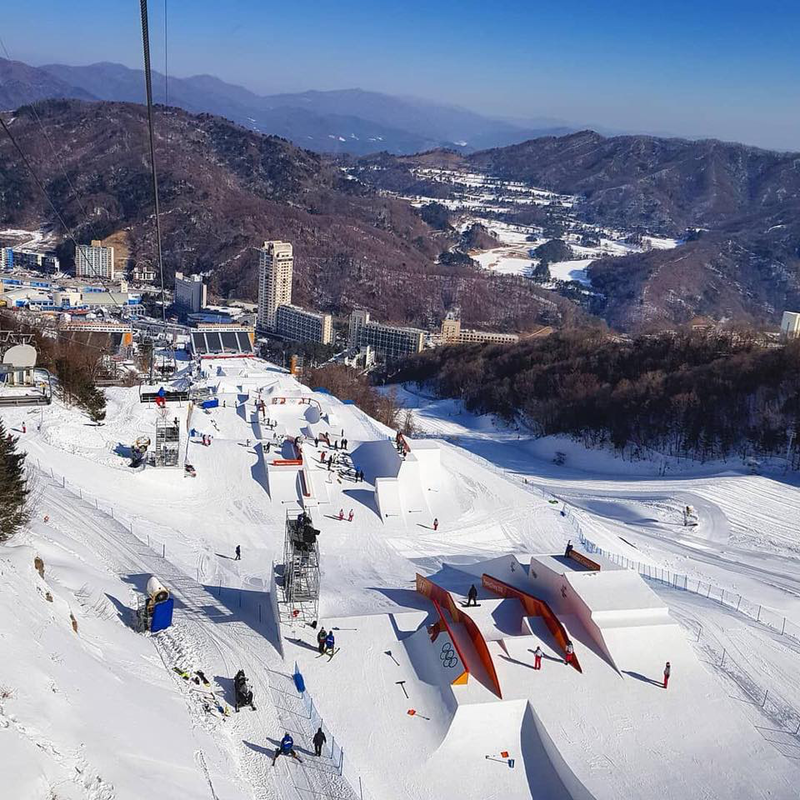 The GB park and Pipe Team were out on the slopestyle course again today and have had the opportunity to test some of the jumps and prepare their competition runs. 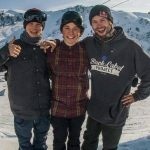 Click on the video below to see an early practice run by Billie Morgan which was filmed by Jamie Nicholls. 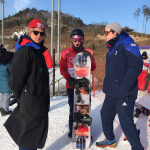 Click on an image below to see a few photo’s of Rowan, Billie and Jamie on the course. 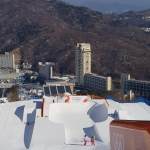 With just two more days to go the team have had a chance to try out the Slopestyle course today and we have had the chance to see the snowboard that Rowan is riding. 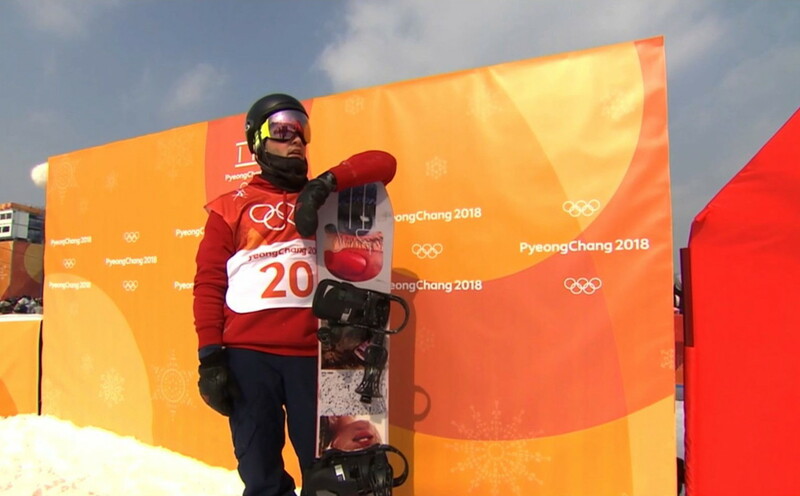 Look out for the Bataleon board with the red bottom. 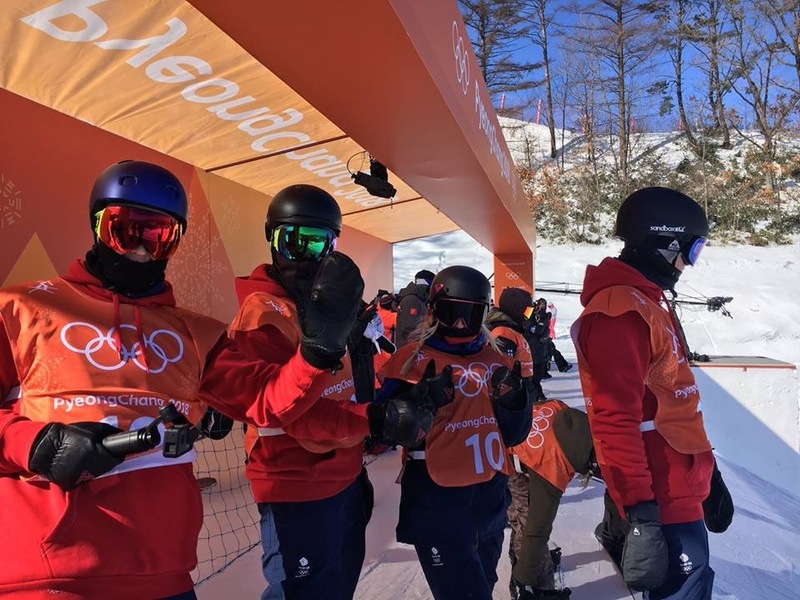 Click on an image below to see more photos of the team on the course. 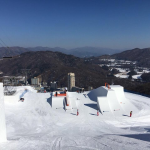 With just 3 days to go the team have had the chance to look at the Slopestyle course for the first time. 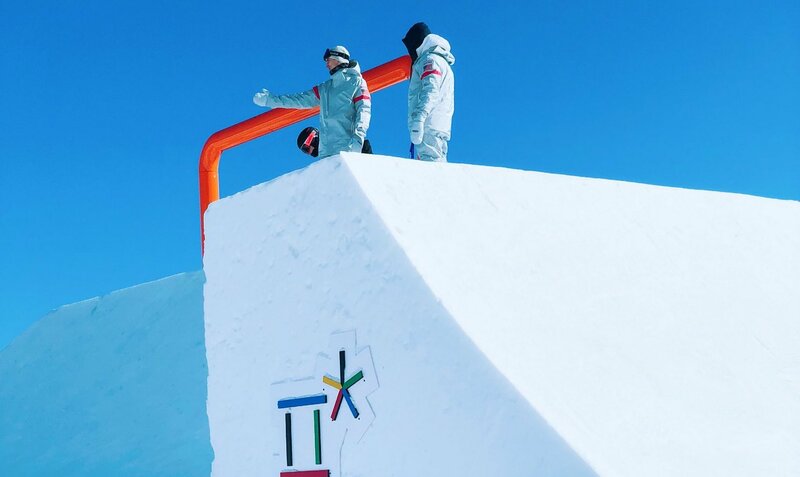 The rails are long and the jumps look fantastic. 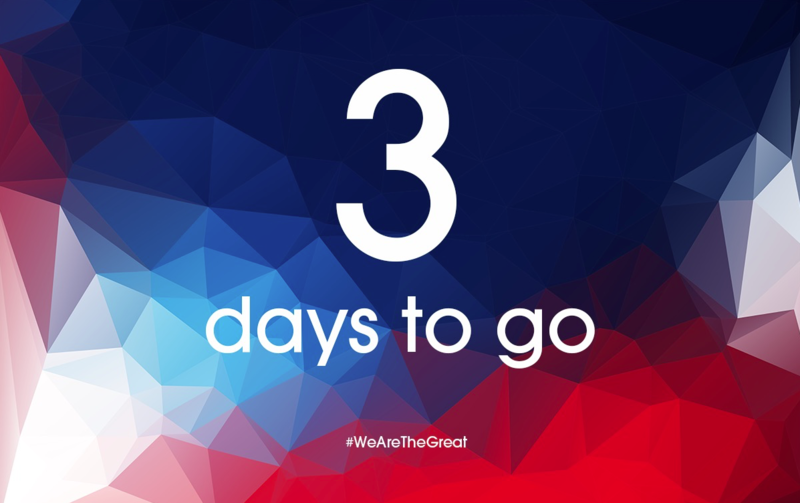 Click on an image below for a sneak preview. 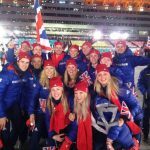 The team couldn’t resist a little team photo with their Programme Manager Lesley Mckenna. 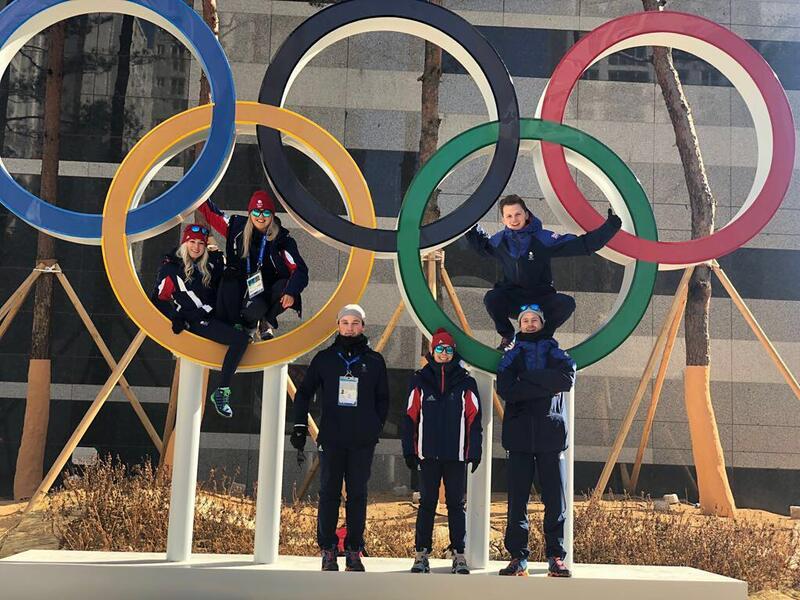 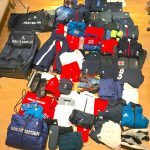 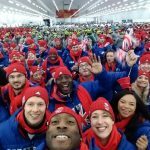 The team were one of the first teams to arrive and the Olympic Village and it was just beginning to fill up with their fellow athletes when Billie Morgan made the video below to have a look at some of the facilities. 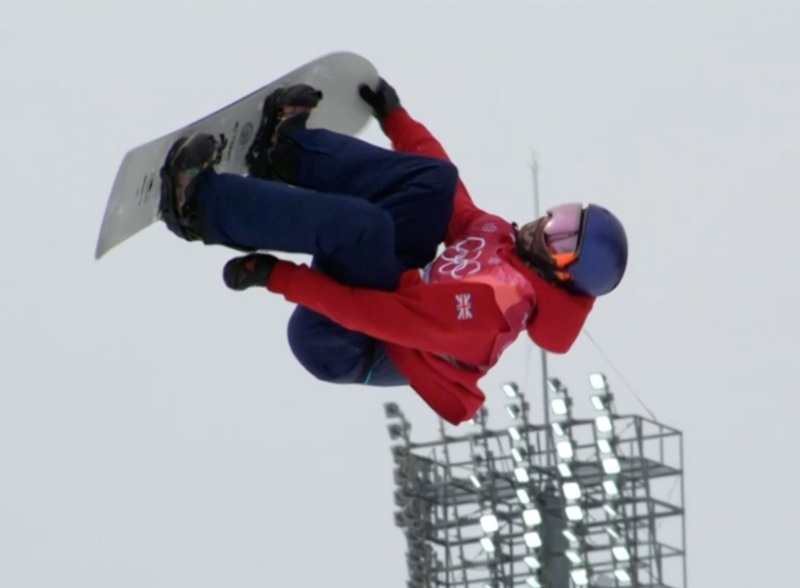 It features Jamie Nichols, Katie Ormerod, Aimee Fuller and Rowan. 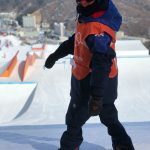 Watch out for the bright pink muffins, they looked awesome! 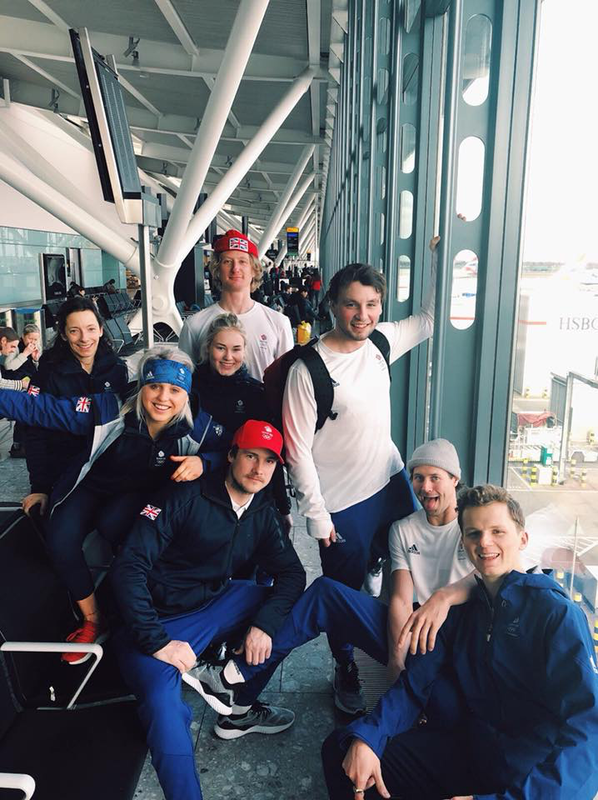 The team are at Heathrow ready for the 9 hour flight to Seoul. 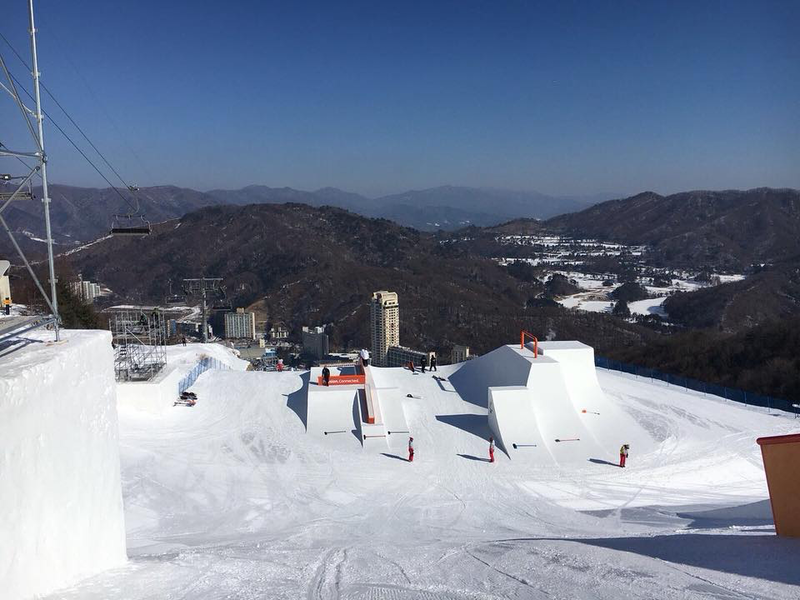 After a rest day they will start training and get a chance to look at the Slopestyle course and the Big Air jump. 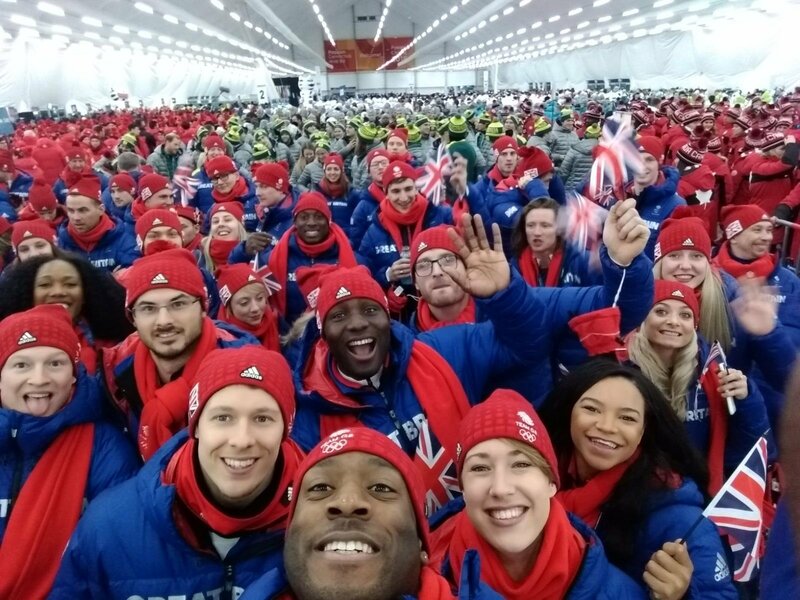 The team have been to Addidas in Stockport to receive their official Team GB Kit. 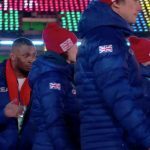 Click to play Rowans section of the Team GB video from the day. 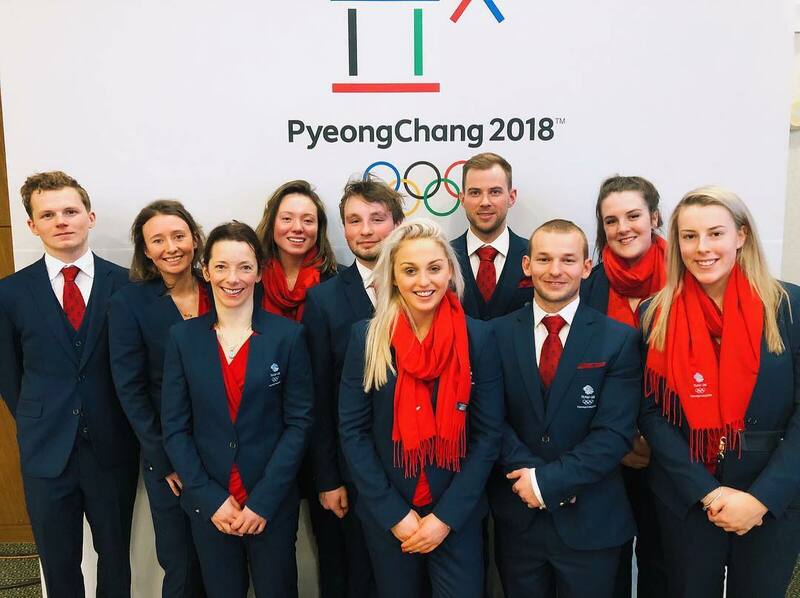 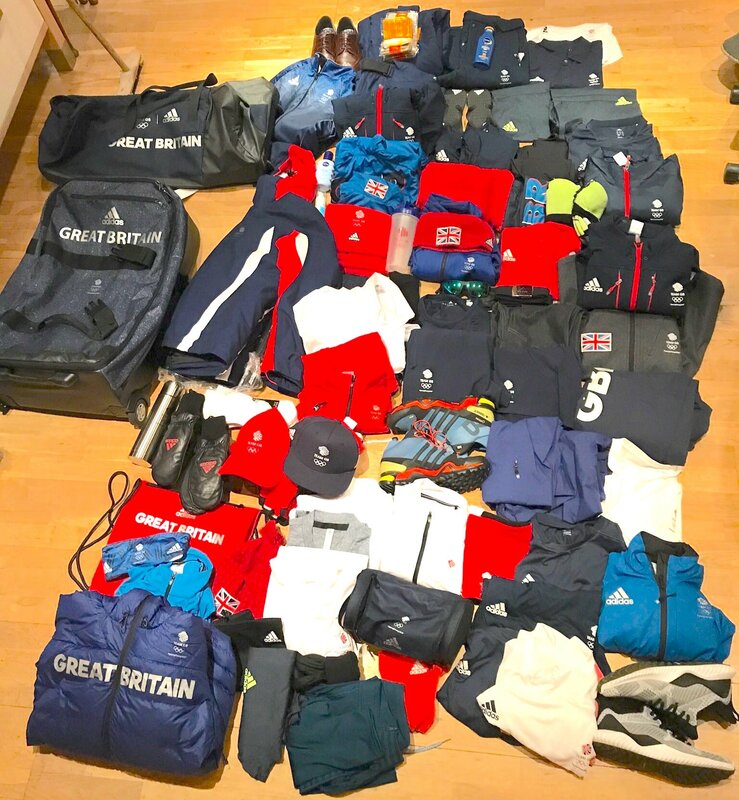 We are pleased to announce that a former student, Rowan Coultas, has just been announced as a member of the Great Britain team who will be competing at the Winter Olympics in PyeongChang next month. 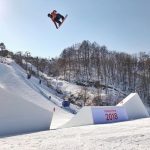 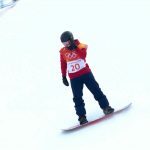 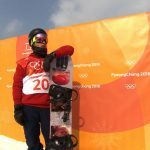 He is the youngest member of the male snowboarding team and will be competing in the Slopestyle competition and the amazing Big Air, in which riders perform spectacular gymnastic “tricks” after launching off a massive ramp. 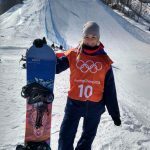 Rowan was one of the first students to take part in our High Performance Programmes which allows students to follow their sporting dreams with the support of the Academy to keep up their academic studies. 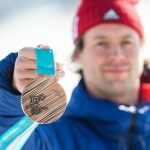 As there is no snow in Cornwall, Rowan and his family had to move to Austria so that he could take his sporting talents to a level that would allow him to compete on the world stage. 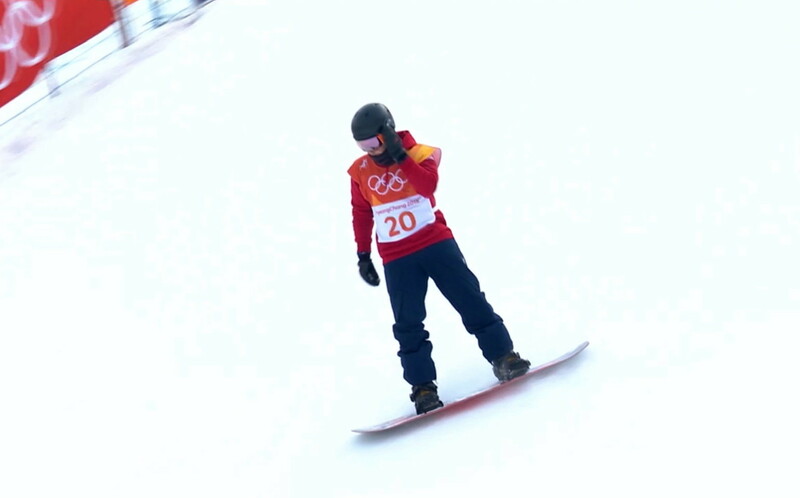 That meant that he needed a school in England to be able to help him with his education. 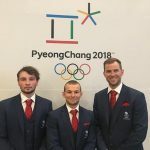 The Academy solution was for Rowan to have a personalised distance learning programme created that allowed him to live and train in Austria during the winter months and return to Cornwall to live with his grandparents in the summer to complete all of his controlled assessments and GCSE examinations. 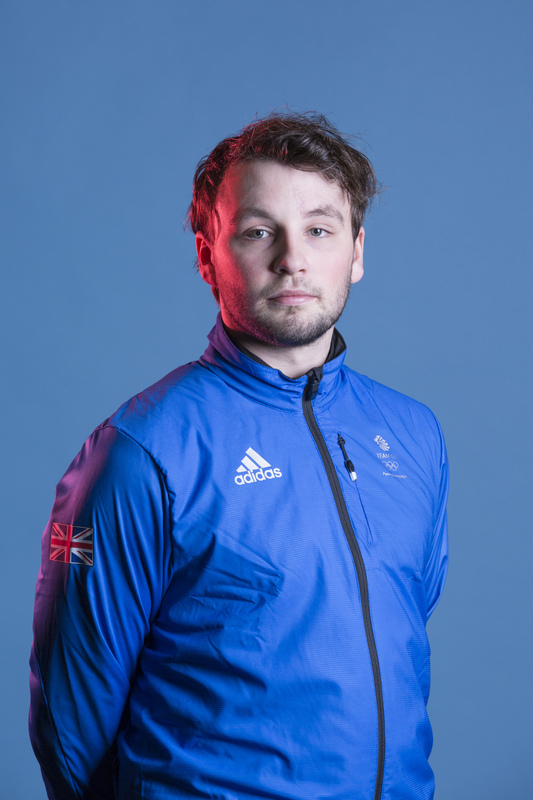 As a result of this Rowan was able to succeed both academically and in his chosen career with this latest announcement leading on from a very impressive season competing all over the world. 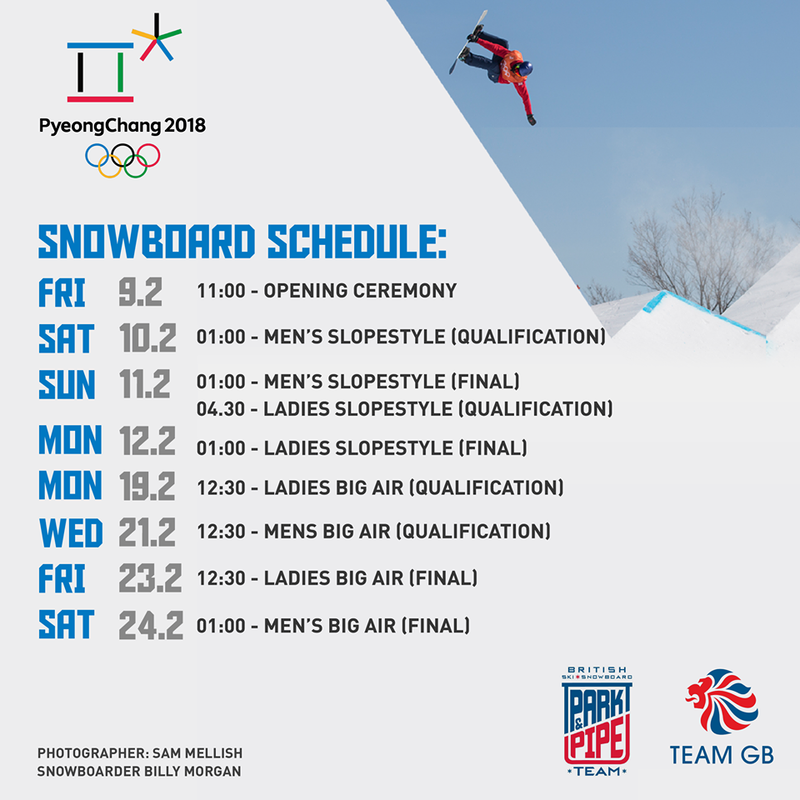 Rowan first event will be the Men’s Slopestyle Qualification competition at the Pheonix Snow Park on 10th February, due to the 9 hour time difference this will be starting at around 01:00 AM in the morning, so if you want to catch him live you may have to be prepared a little sleep! 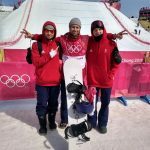 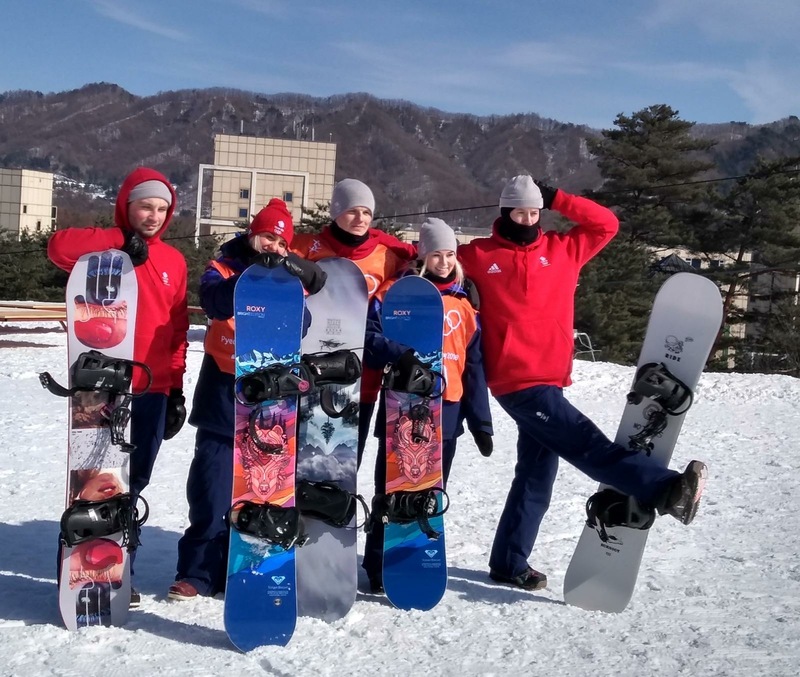 Take a look at the video below to see Rowan and the GB Park and Pipe Team in action and follw their 4 year journey from Sochi 2014 to PyeongChang 2018. ProjectPY 2018: The road to South Korea from Life Cinematic on Vimeo.